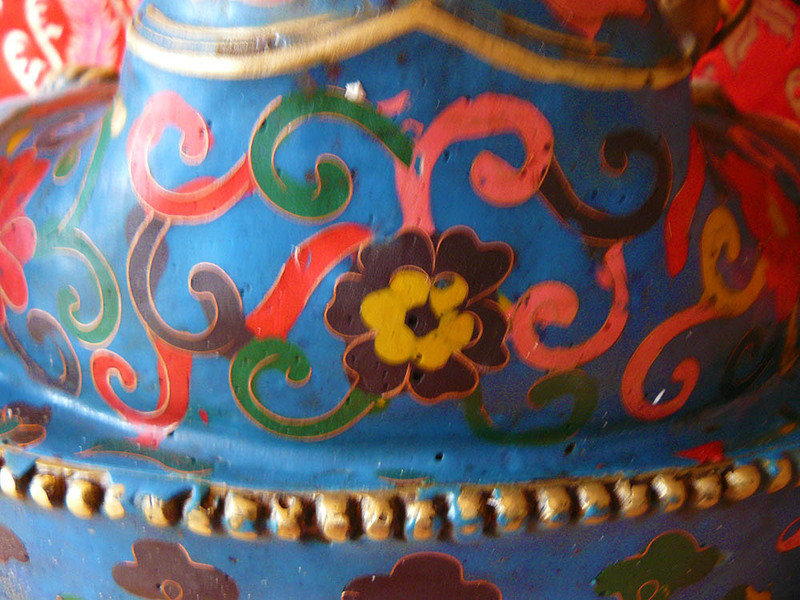 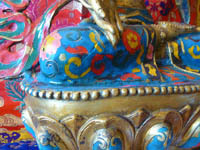 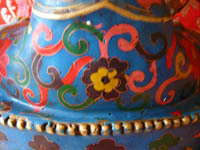 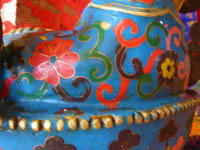 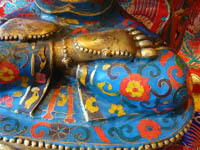 A gilded and painted bronze statue. 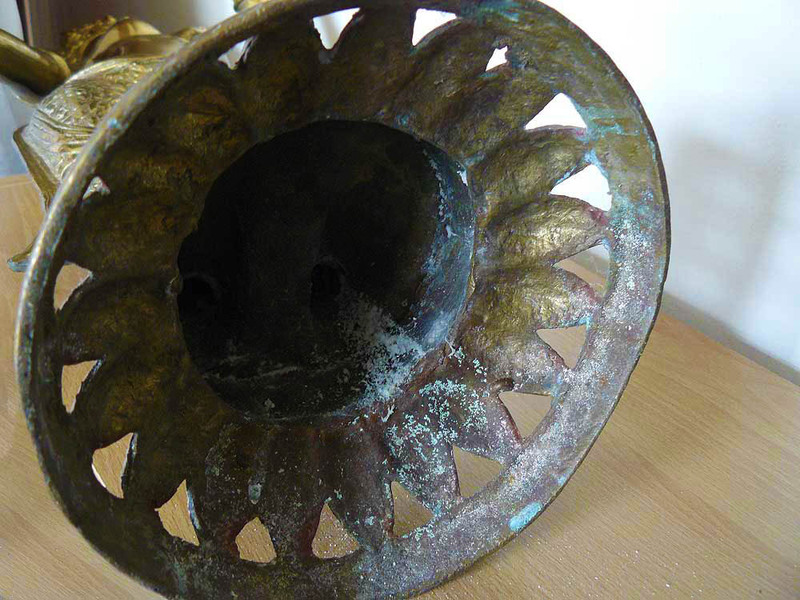 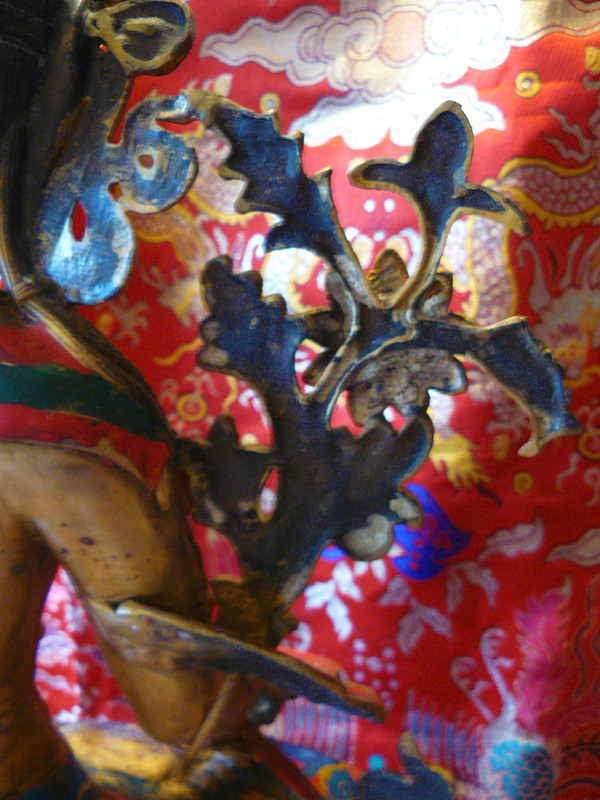 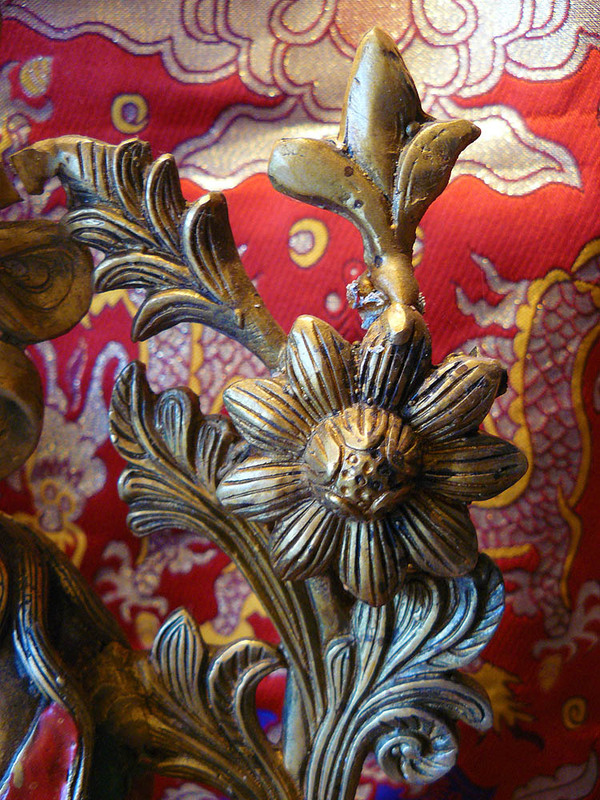 A gilded bronze statue with traces of red. 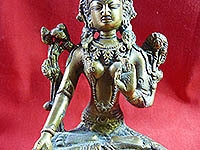 A bronze or brass statue. 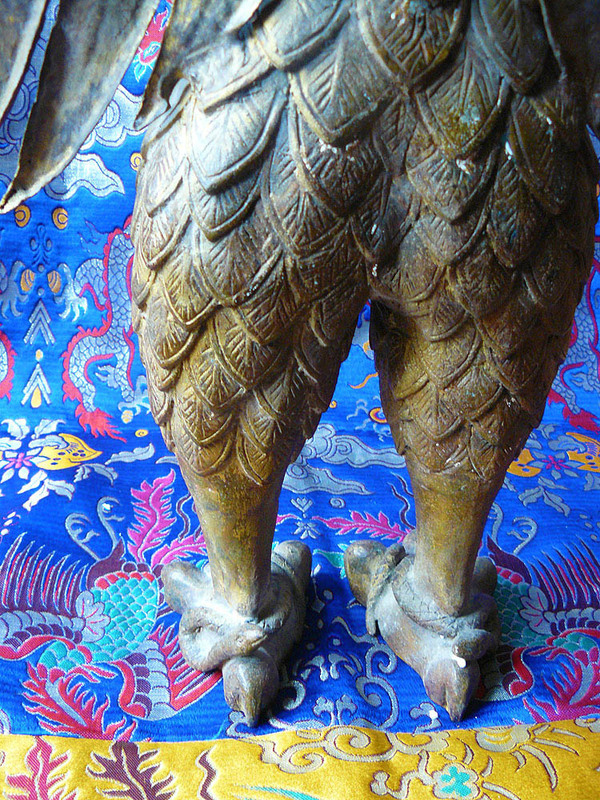 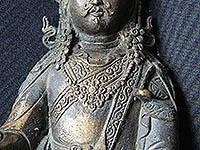 A bronze statue with traces of gilding. 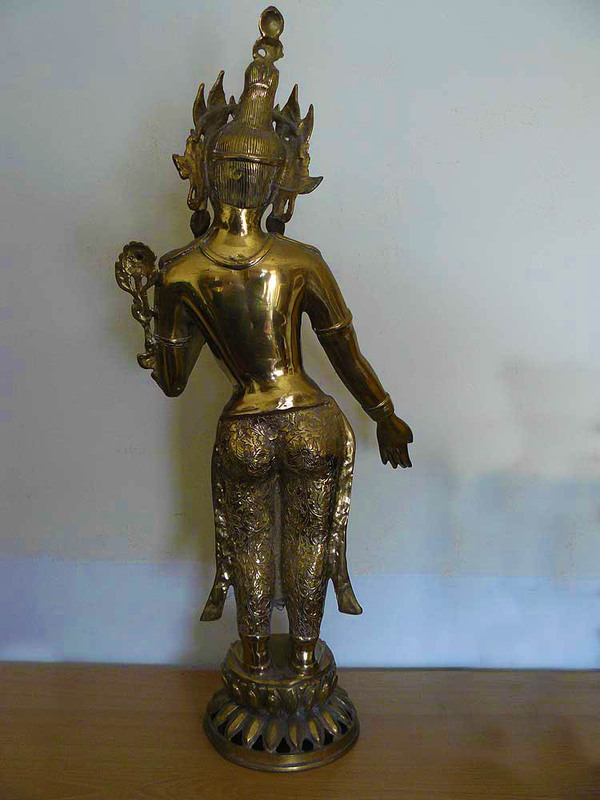 A large standing brass statue. 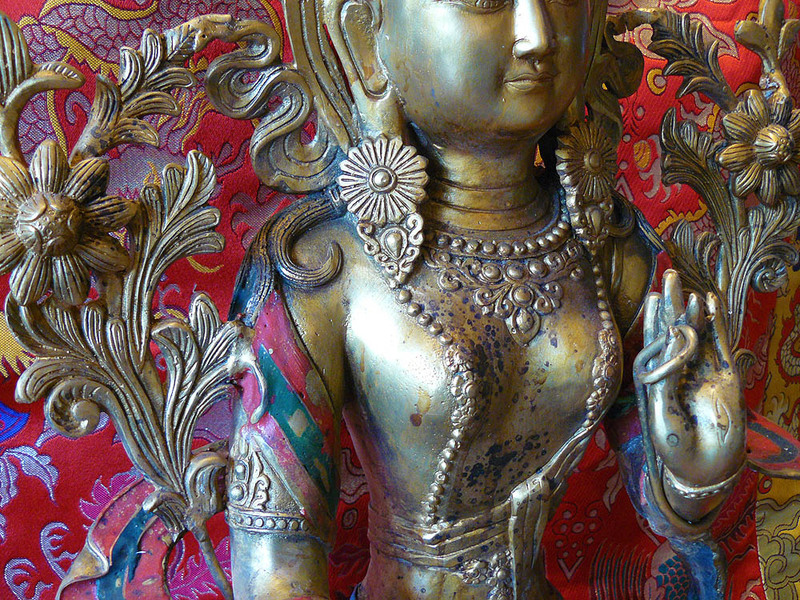 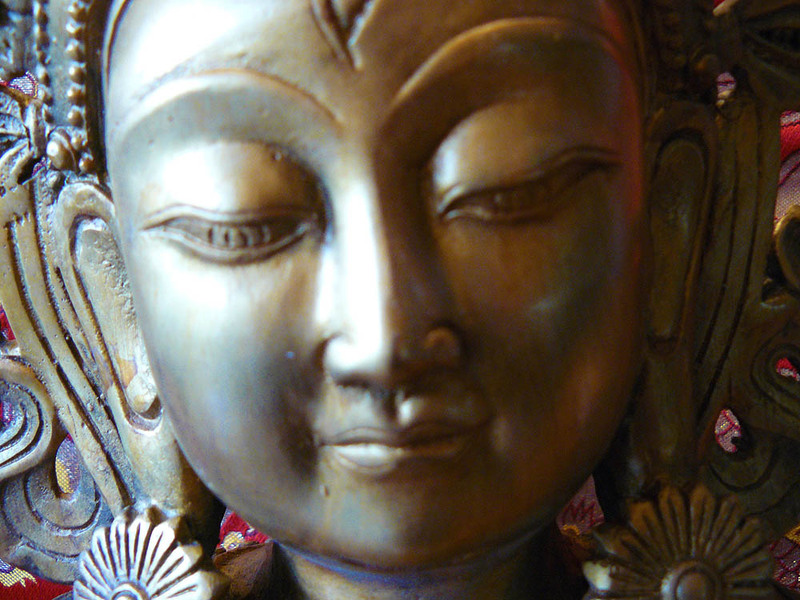 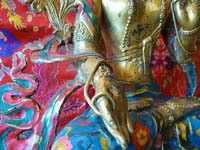 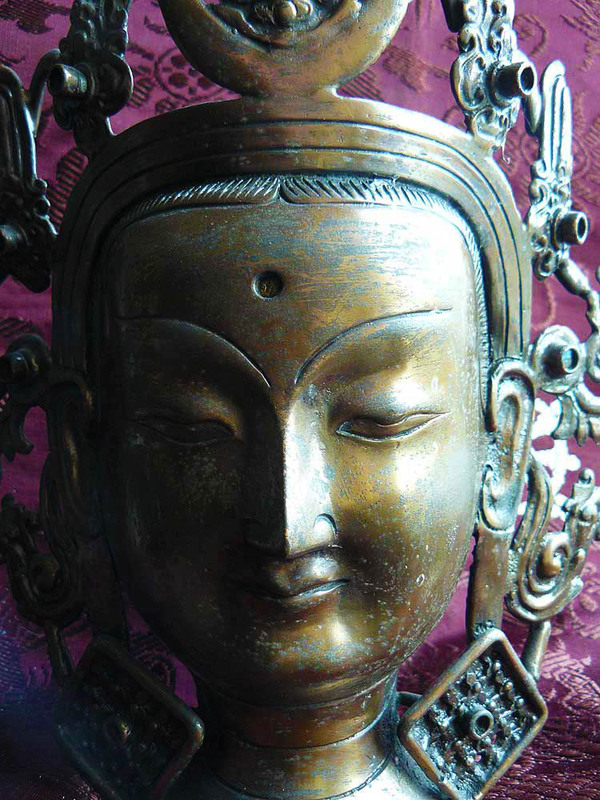 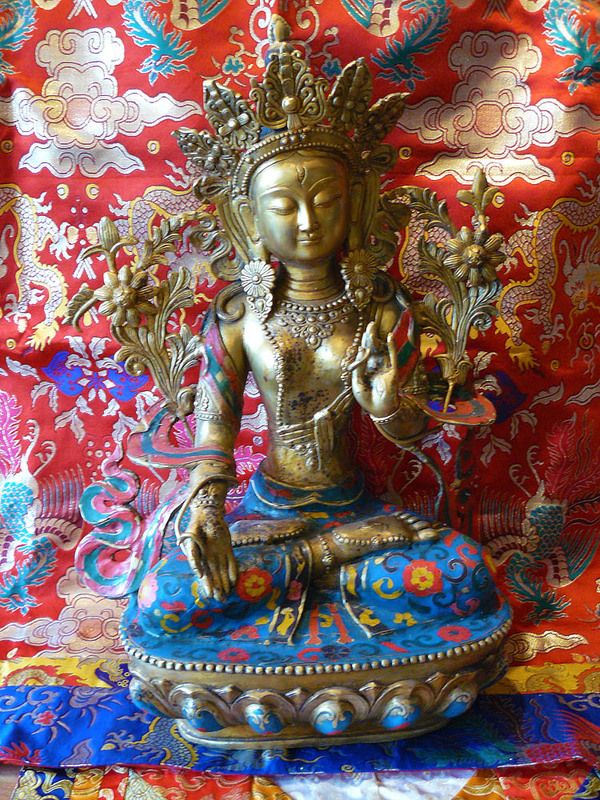 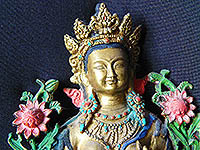 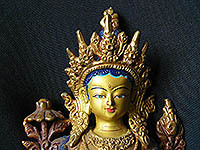 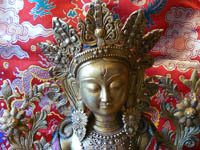 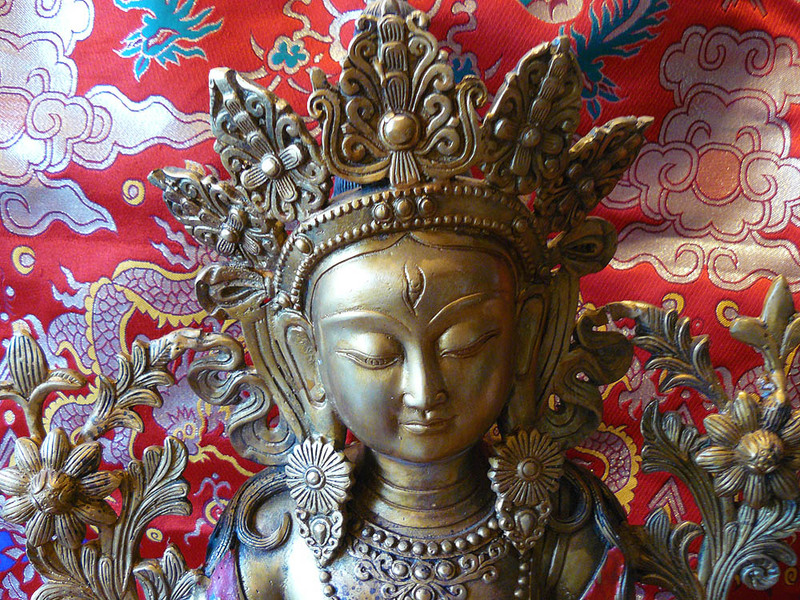 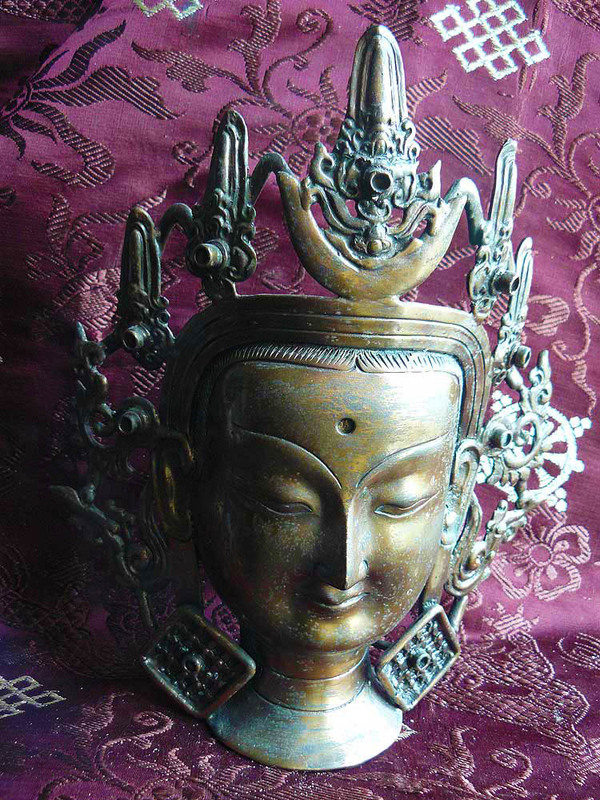 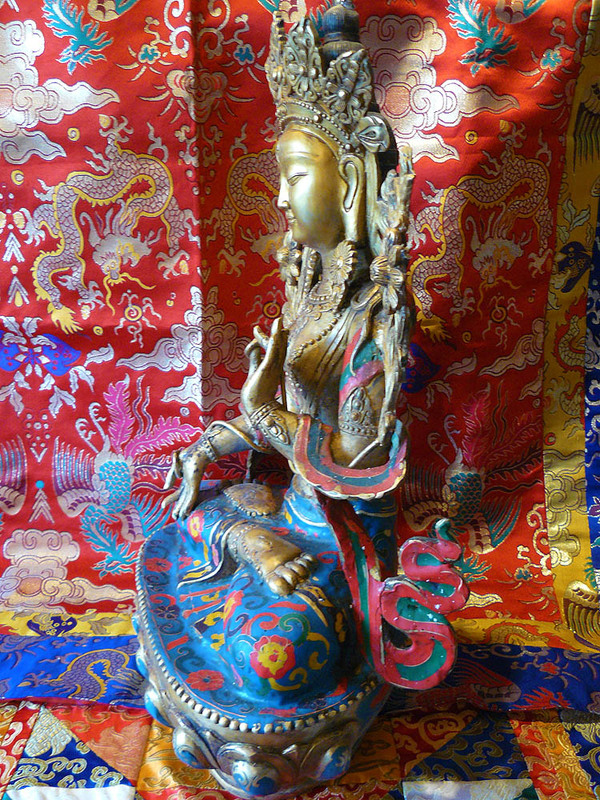 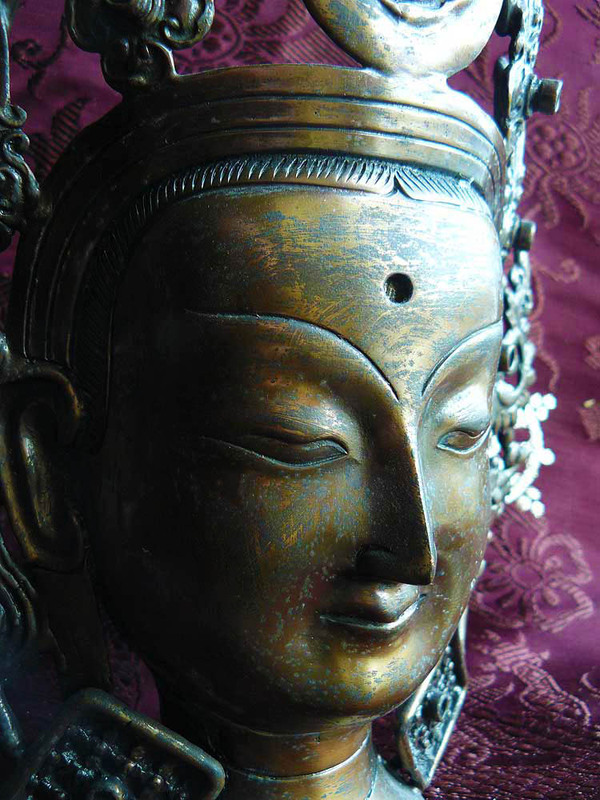 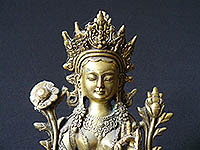 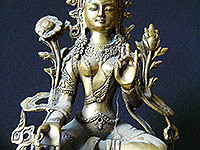 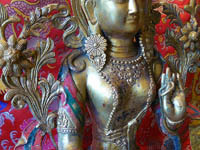 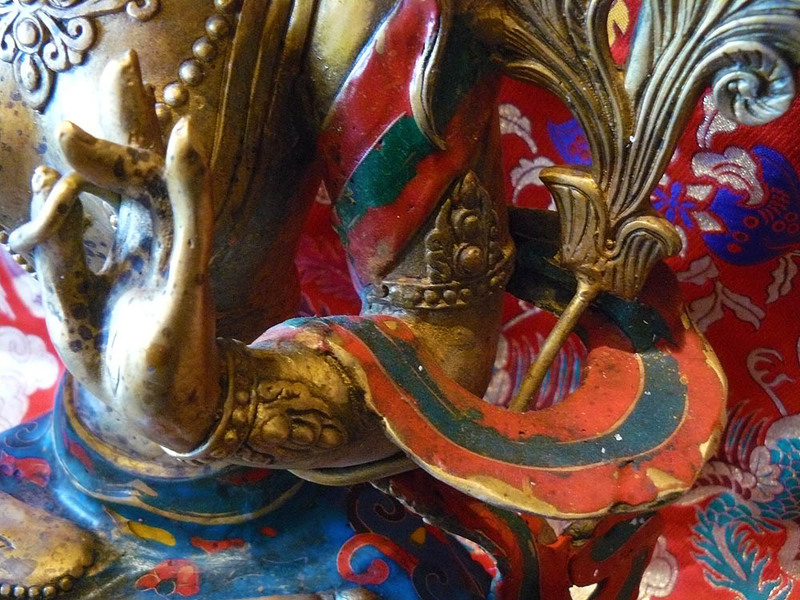 An impressive, very beautiful, large and very heavy statue of White Tara with cloisonné decoration. 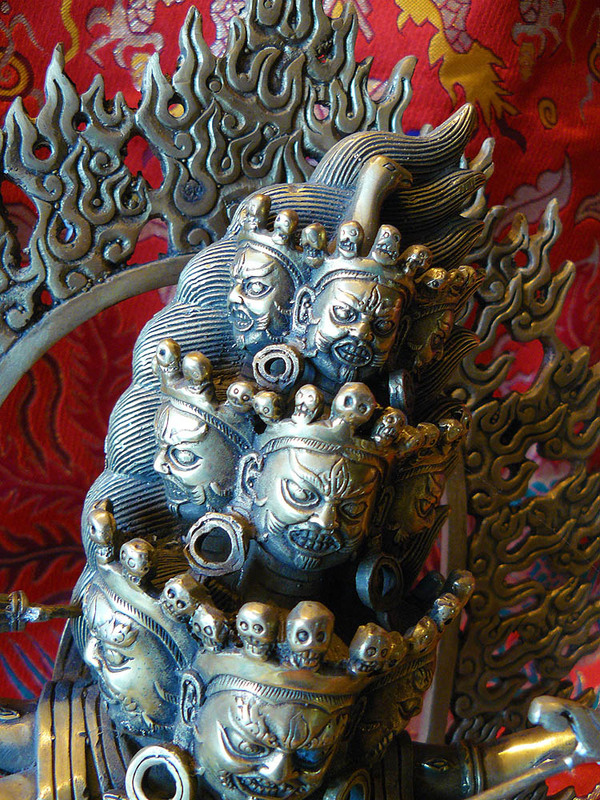 An impossing large statue of the most wrathful of protectors. 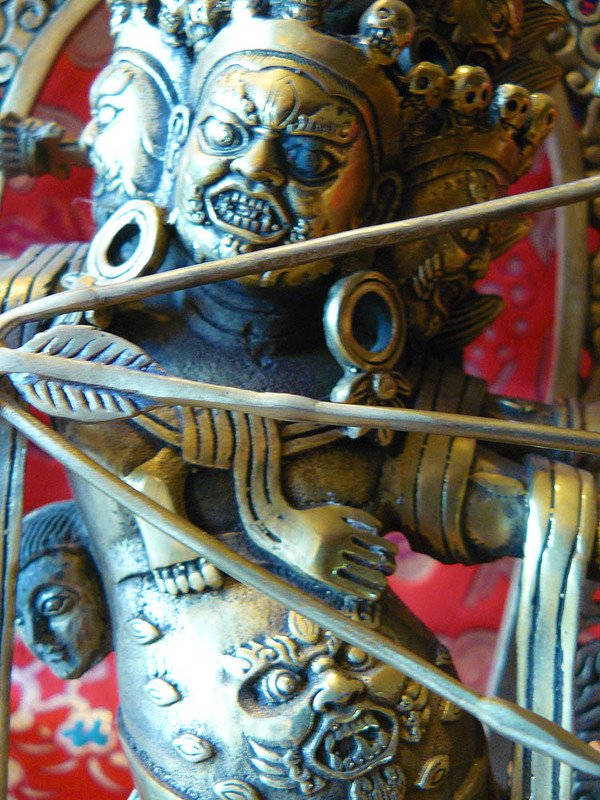 Rahula is fiercely wrathful with his nine heads arising from an oceam of blood on his great snakes tail. 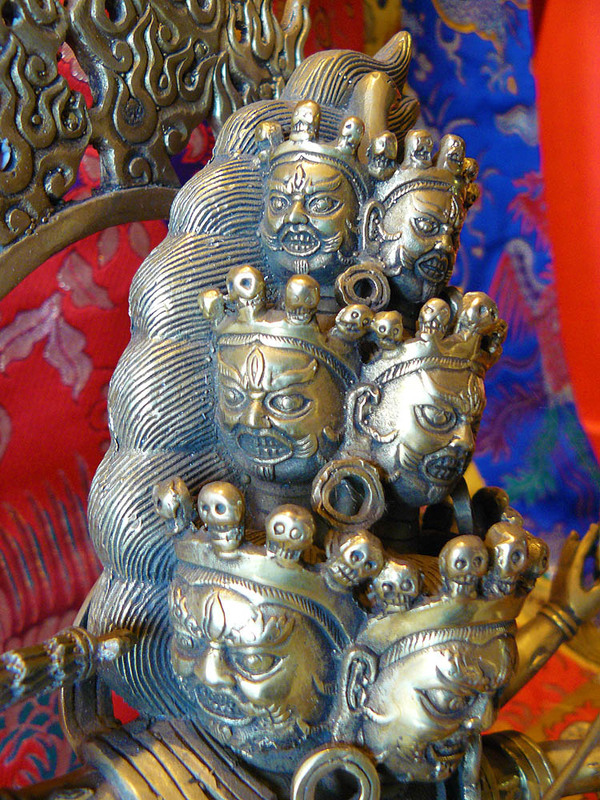 Each of his faces has three large eyes and a gaping mouth with exposed fangs. 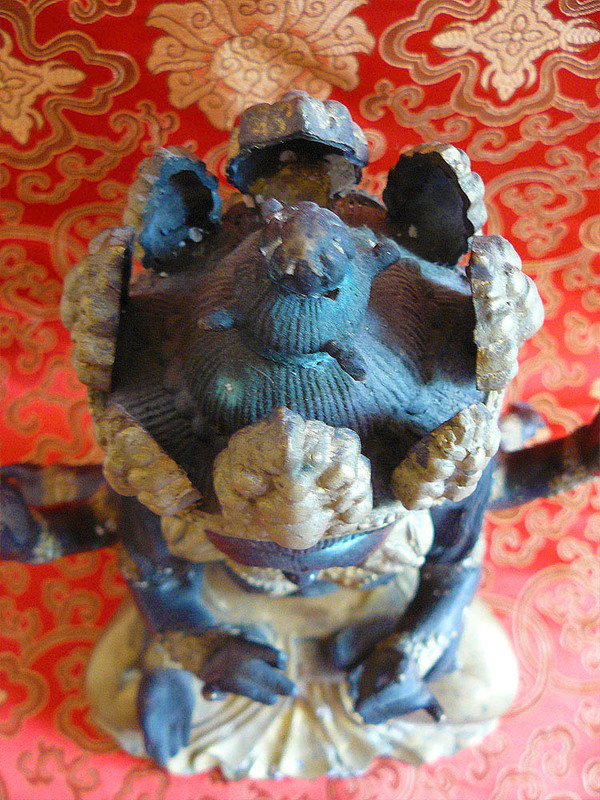 On his stomach is the large face which devoured the nine planets of our solar system. 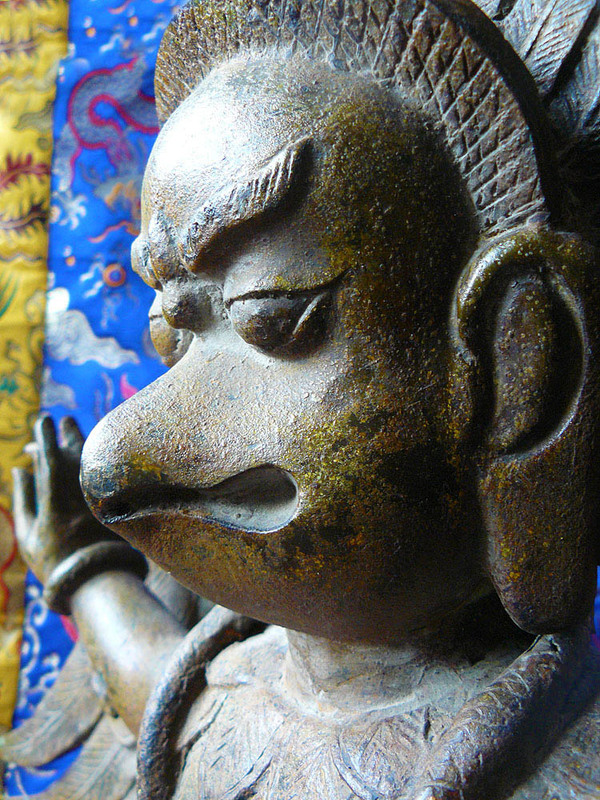 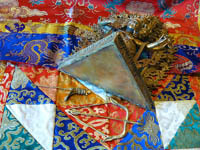 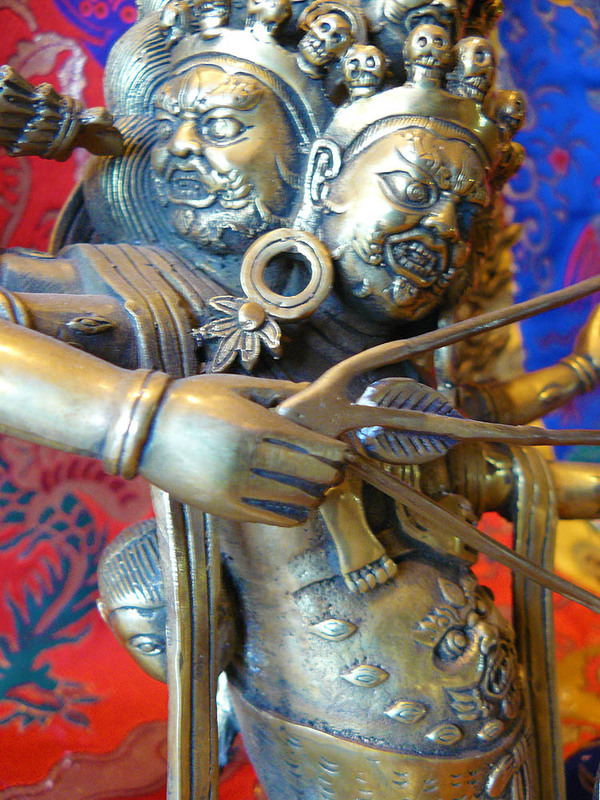 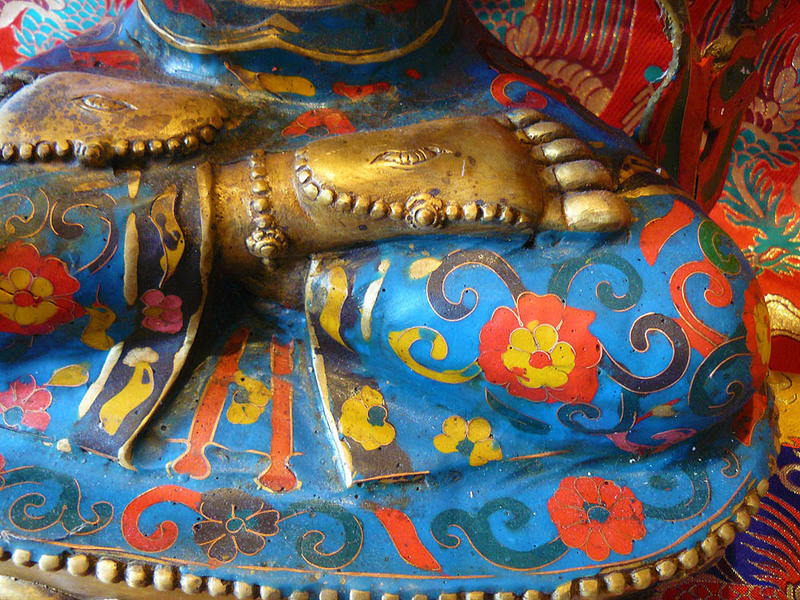 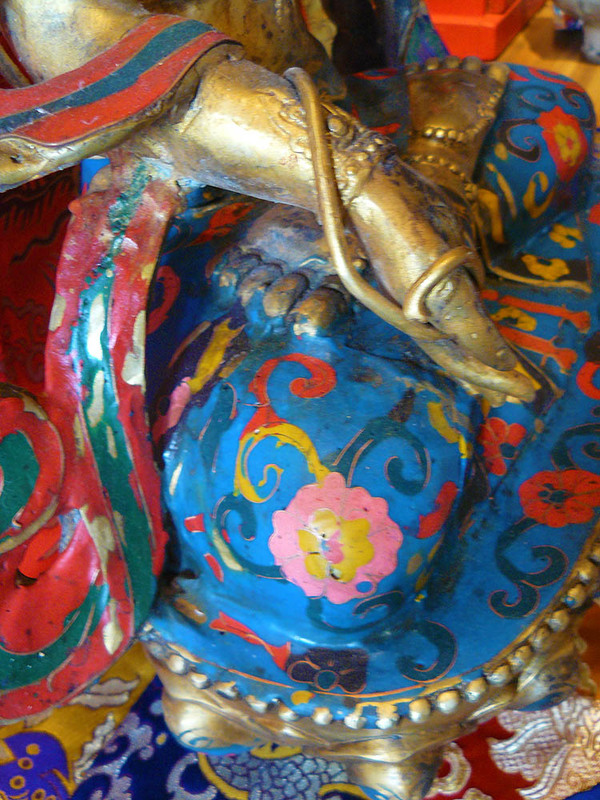 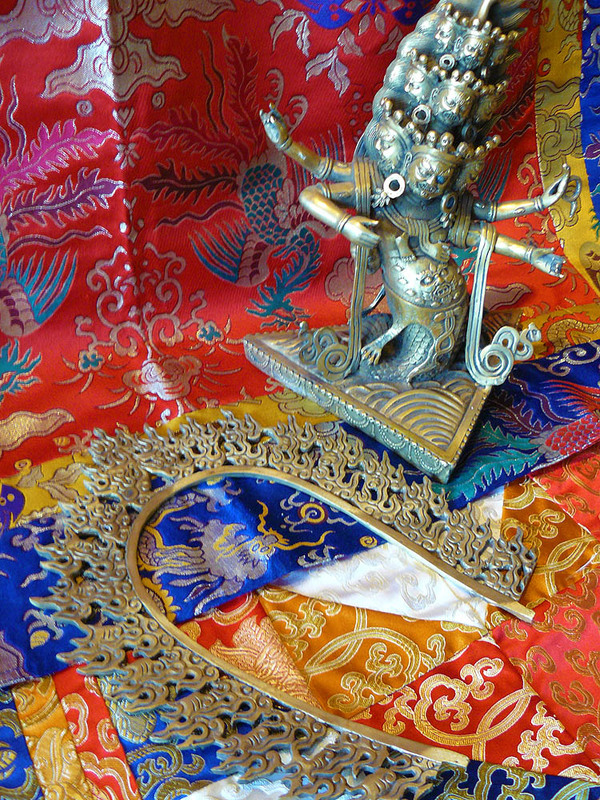 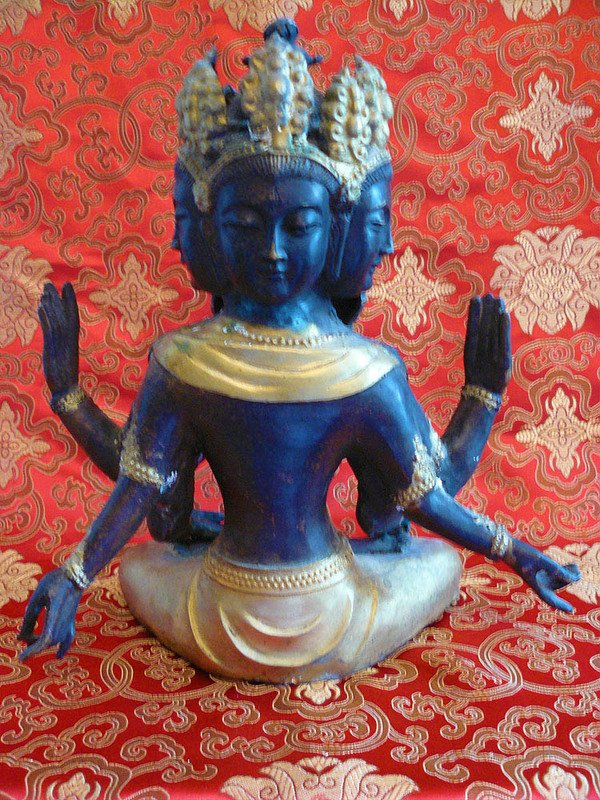 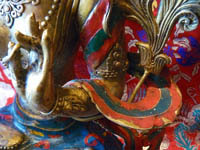 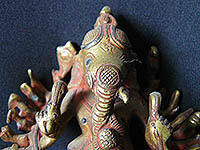 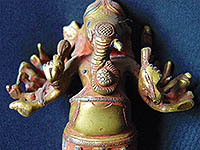 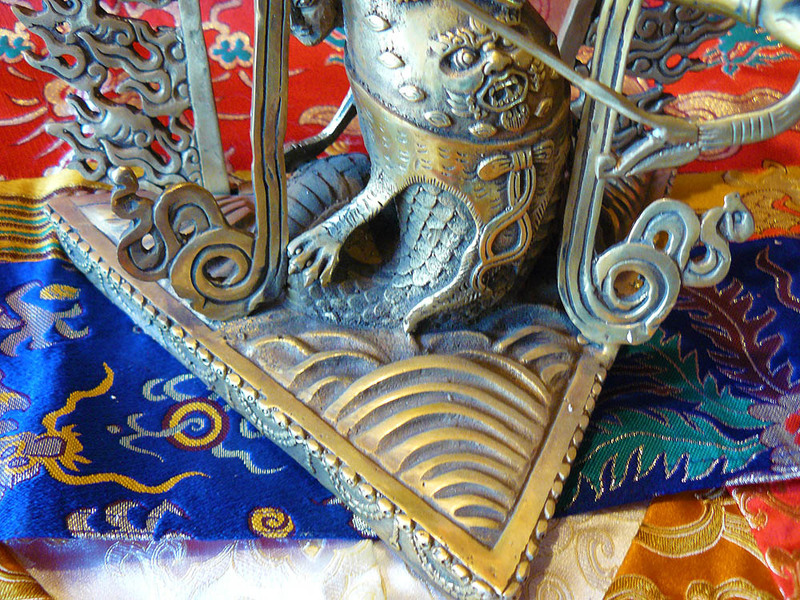 His body is covered with numerous eyes indicating that he is protecting the sacred teachings in all ten directions. 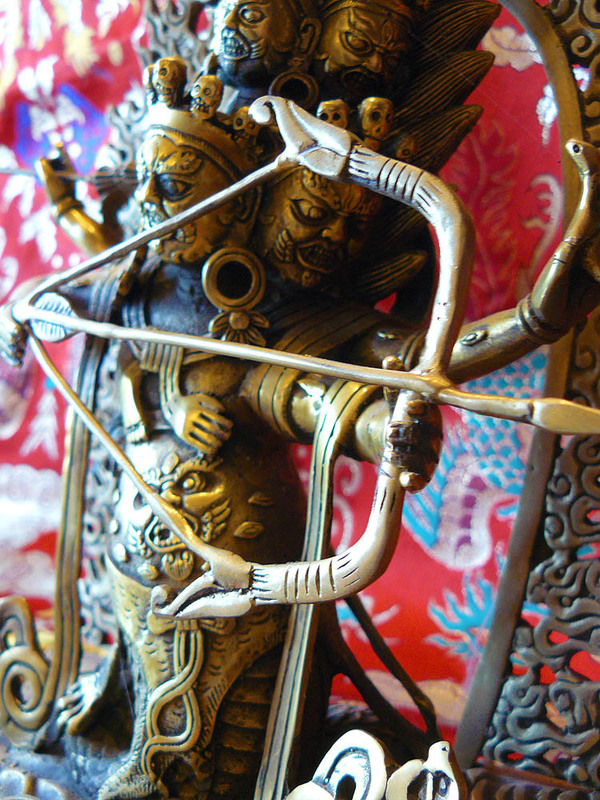 The draws a mighty bow and arrow while holding aloft a scepter and a snake lasso for binding neurosis. 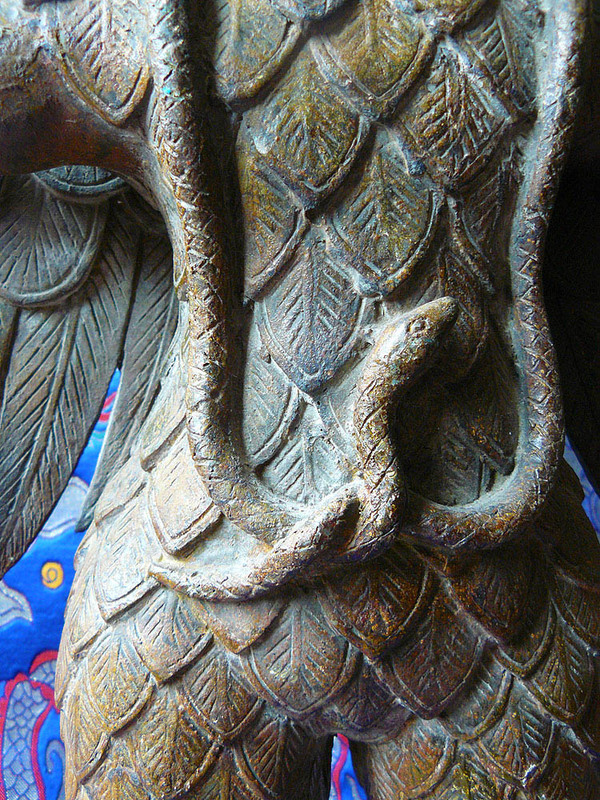 His lower body is that of a coiled naga serpent arising from an ocean of blood, symbolizing the release of worldly attachments. 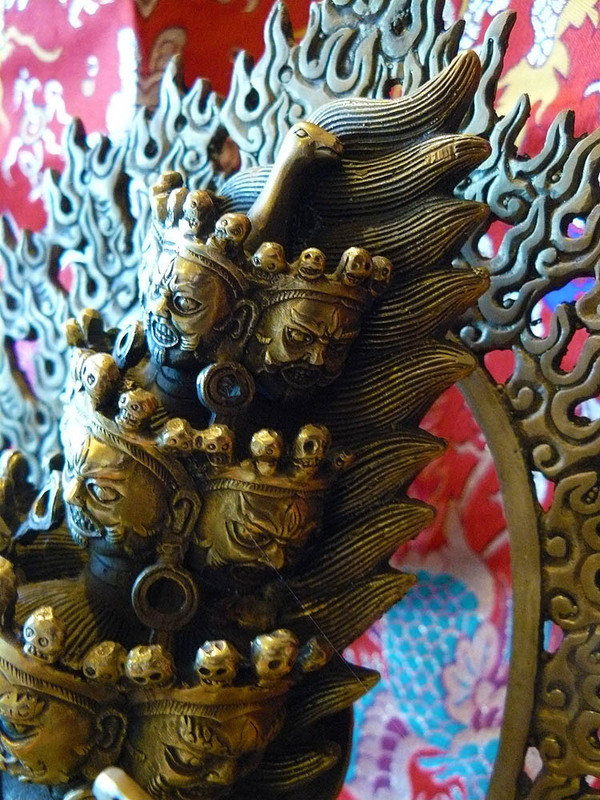 Flames and smoke surround him in a halo, symbolising the incineration of all the miseries of the world. 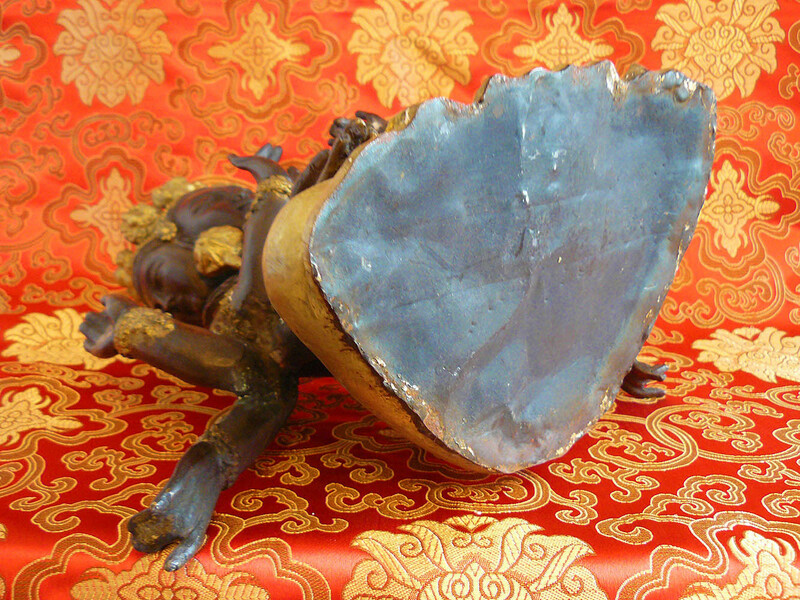 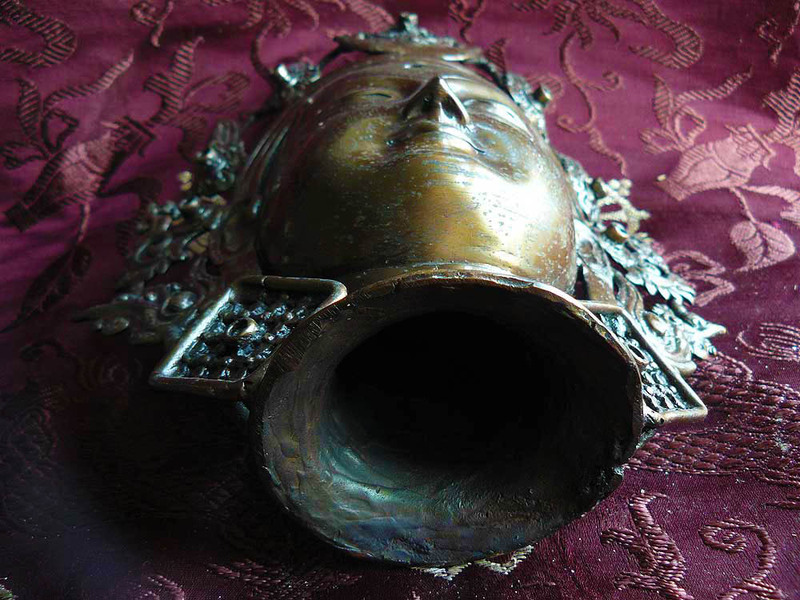 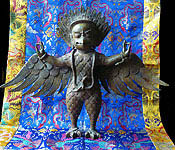 This is a very powerful and rare statue and would be a wonderful addition to any altar or shrine room. 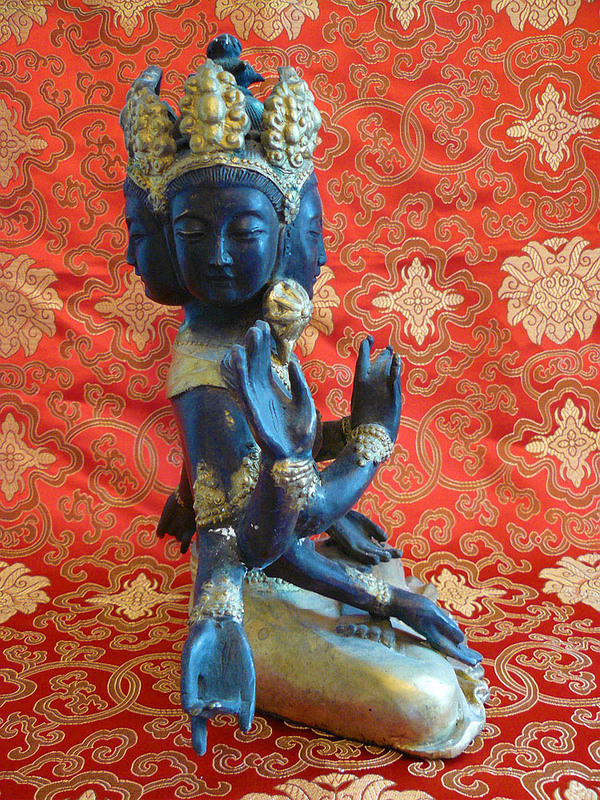 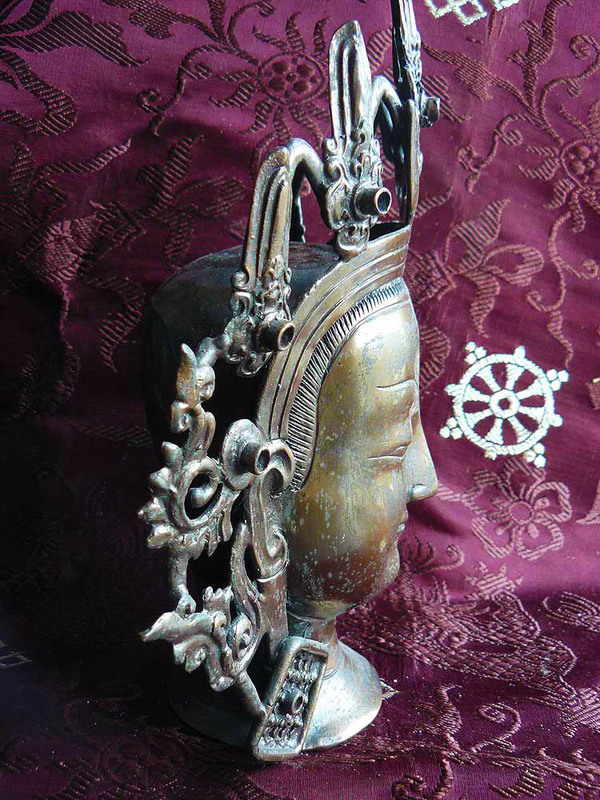 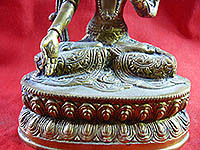 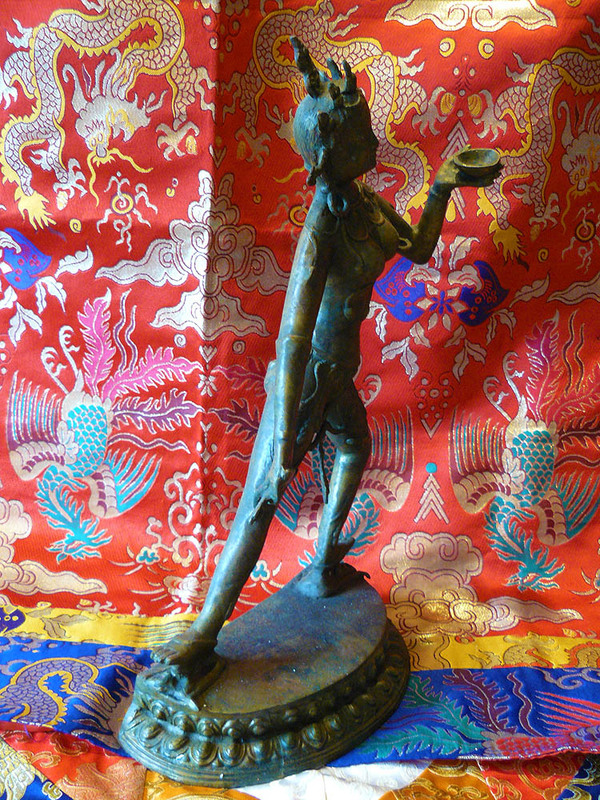 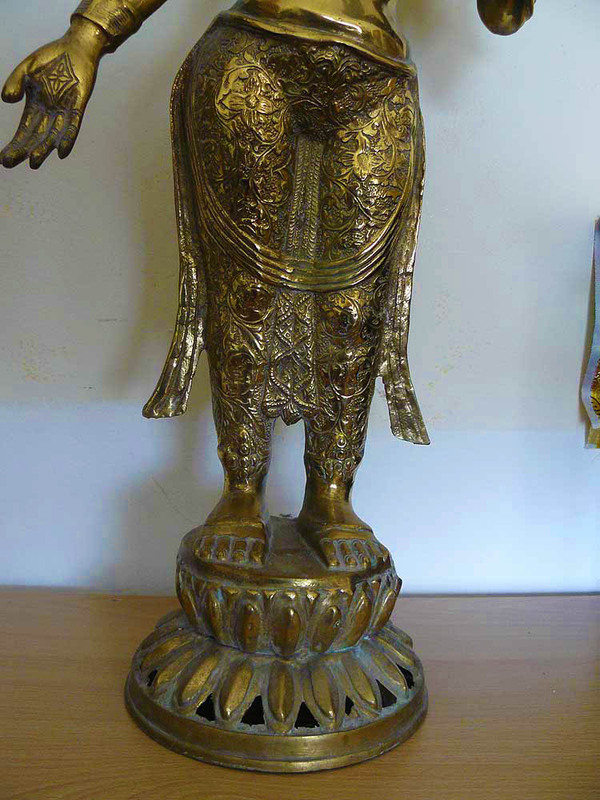 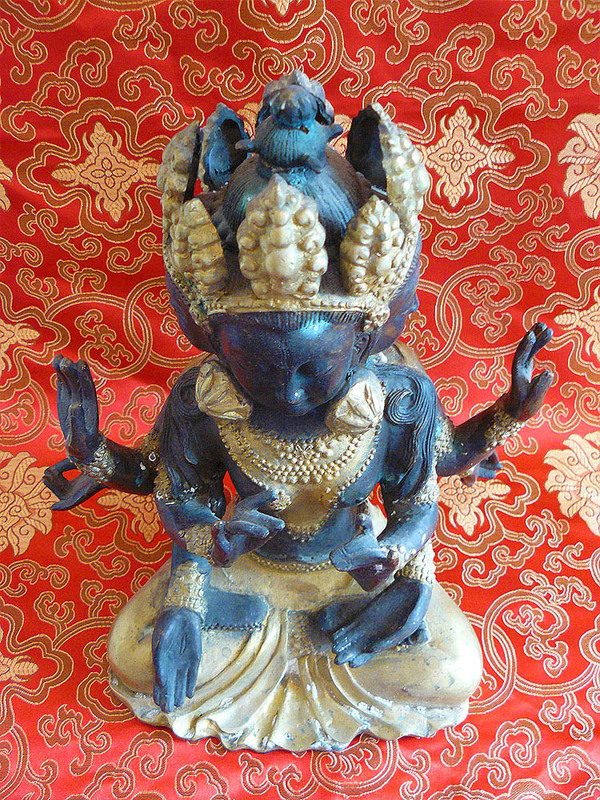 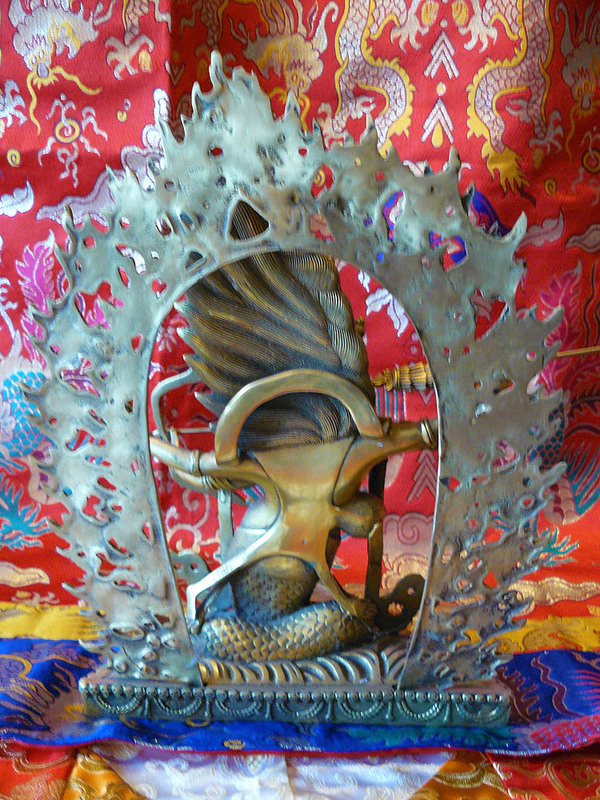 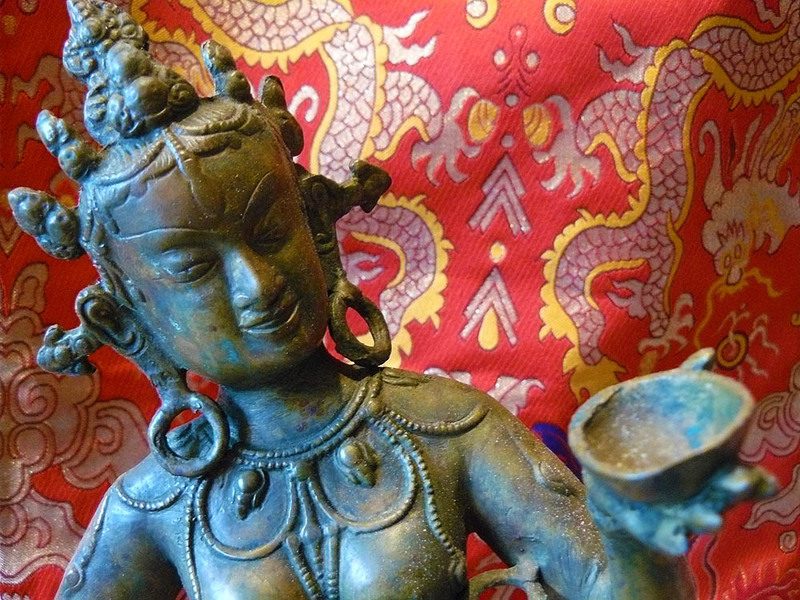 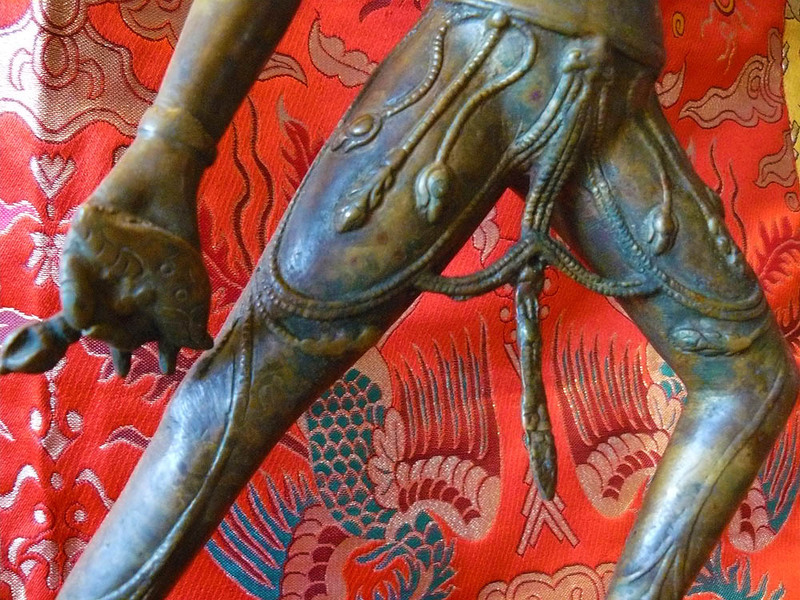 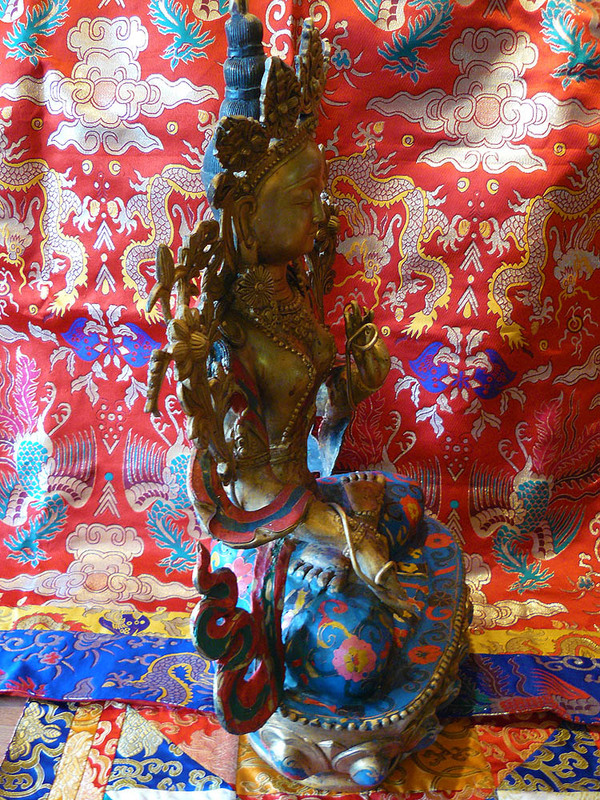 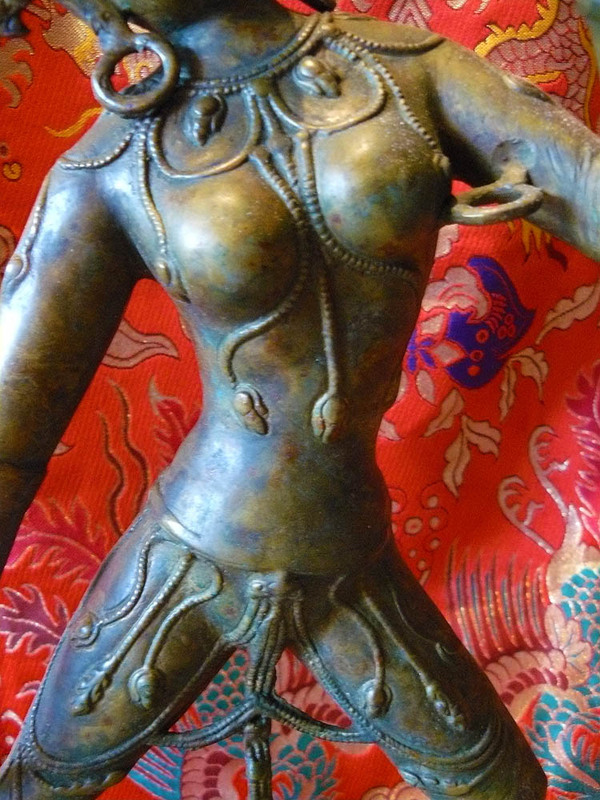 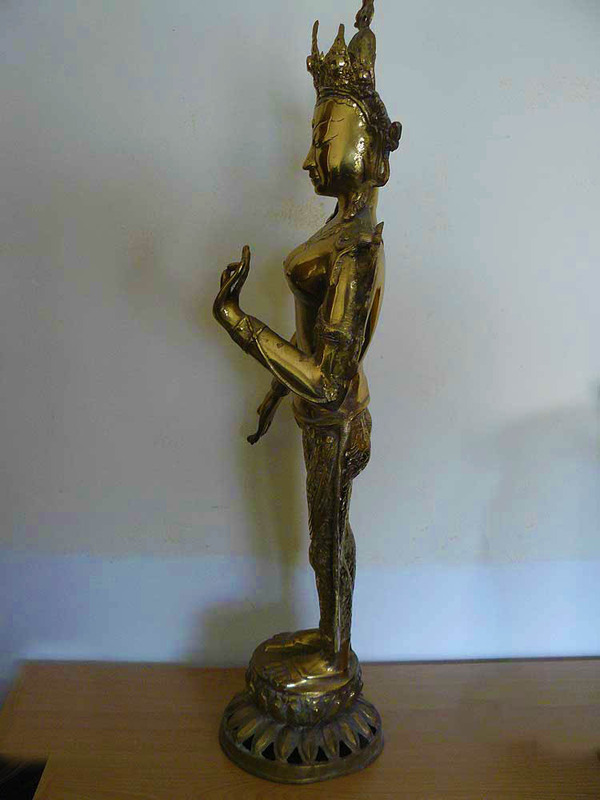 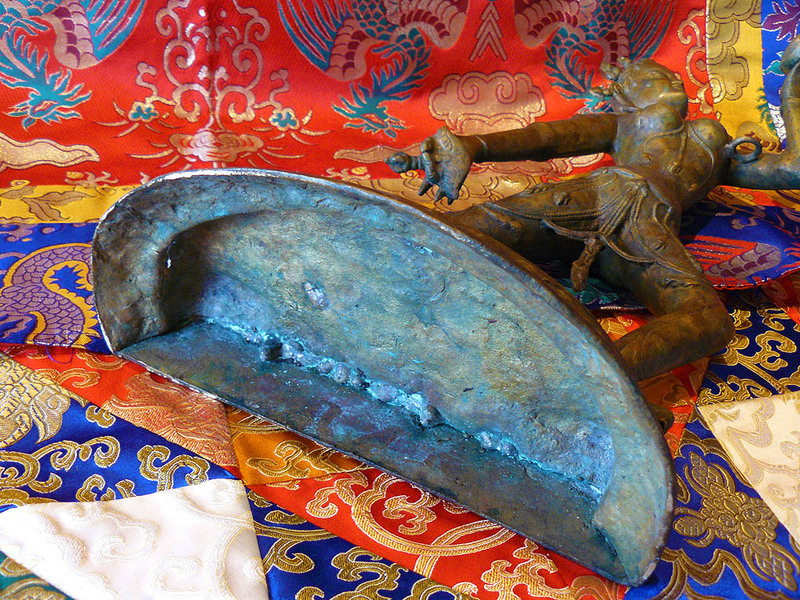 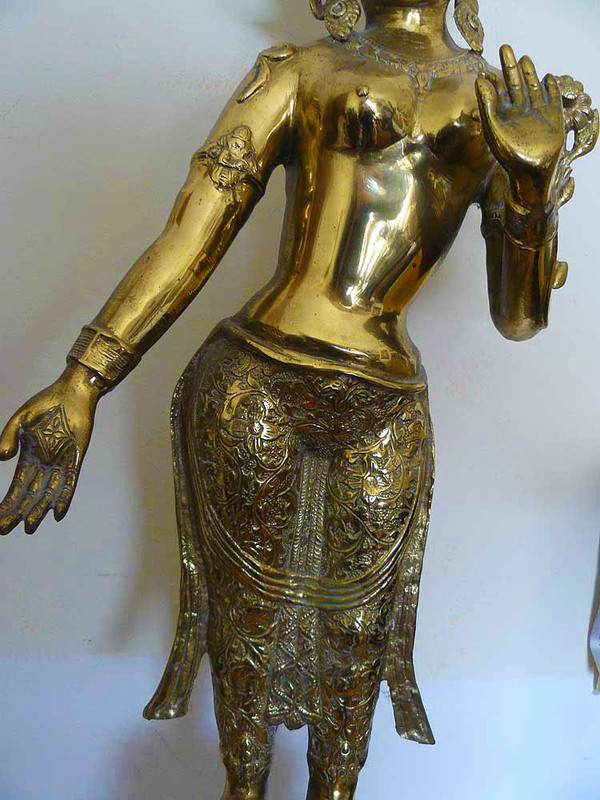 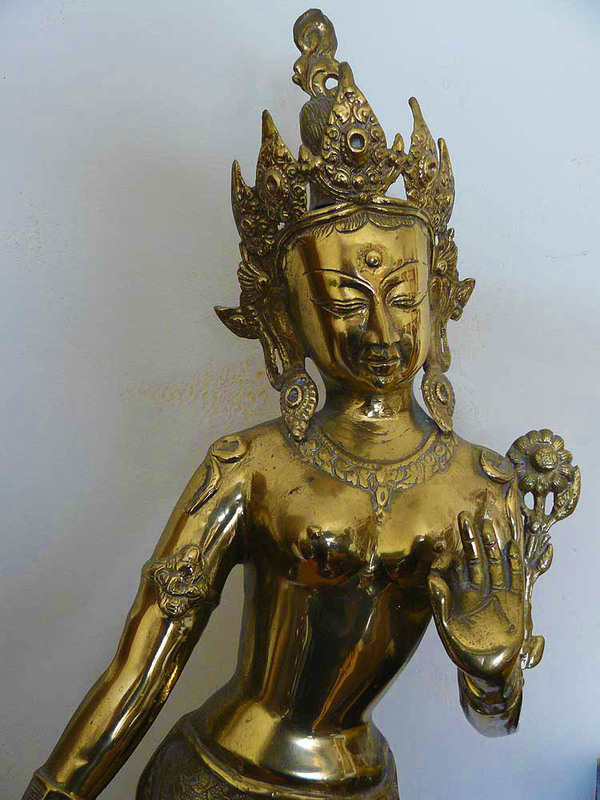 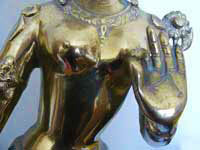 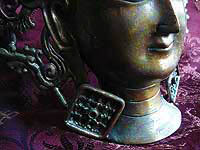 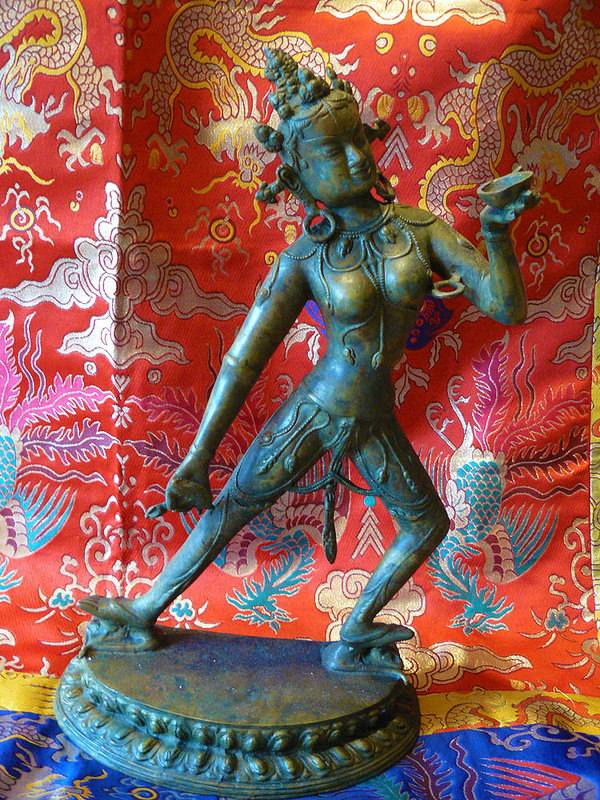 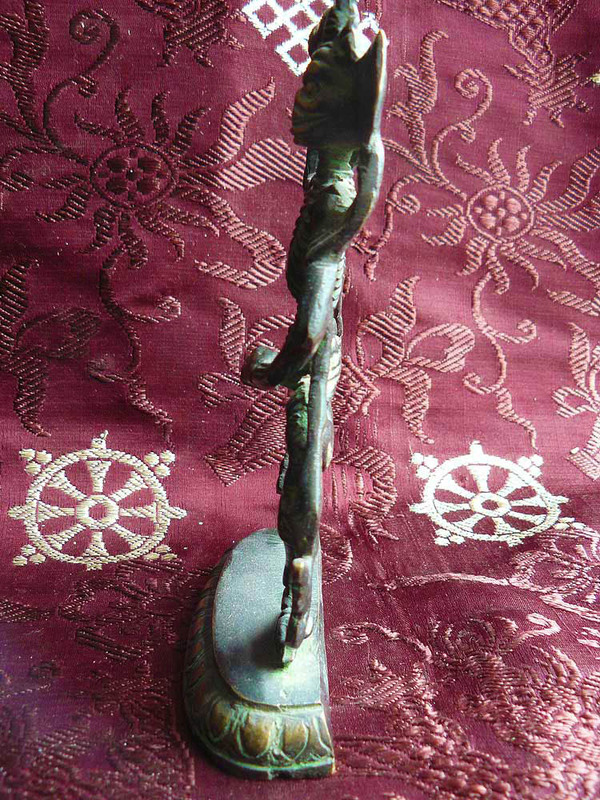 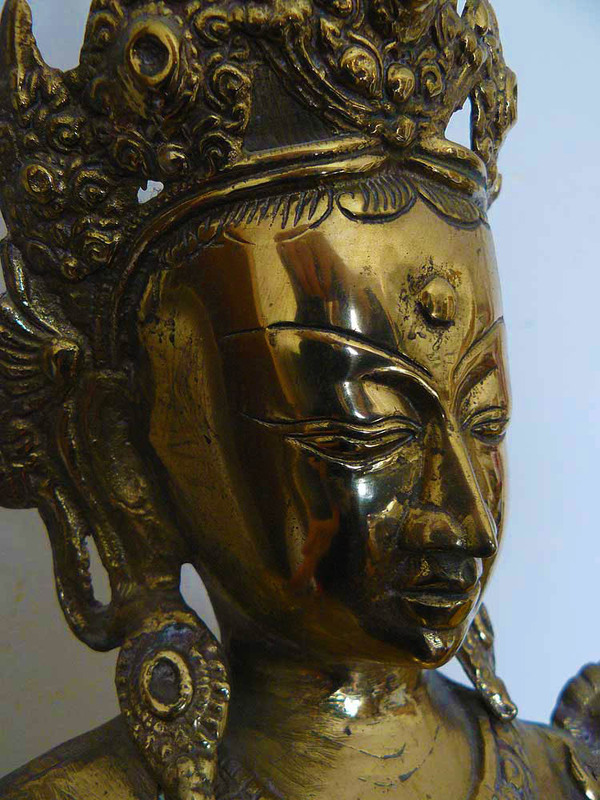 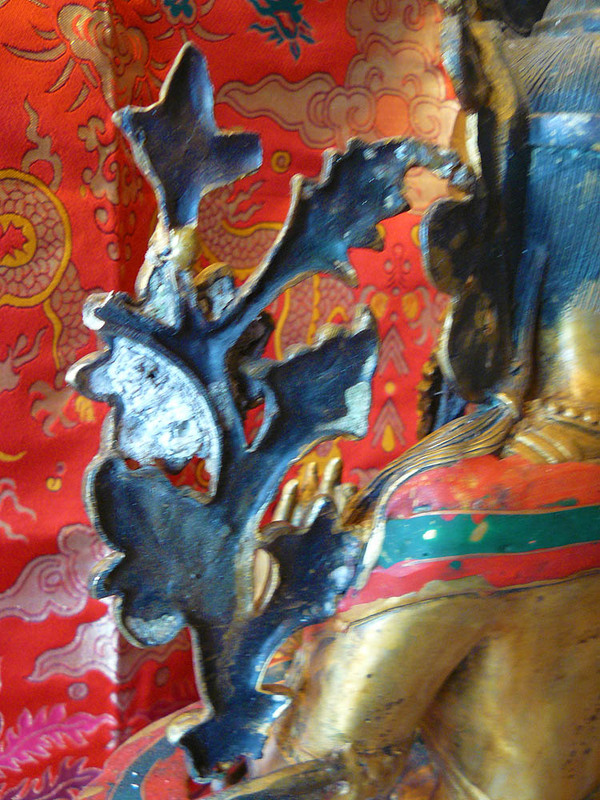 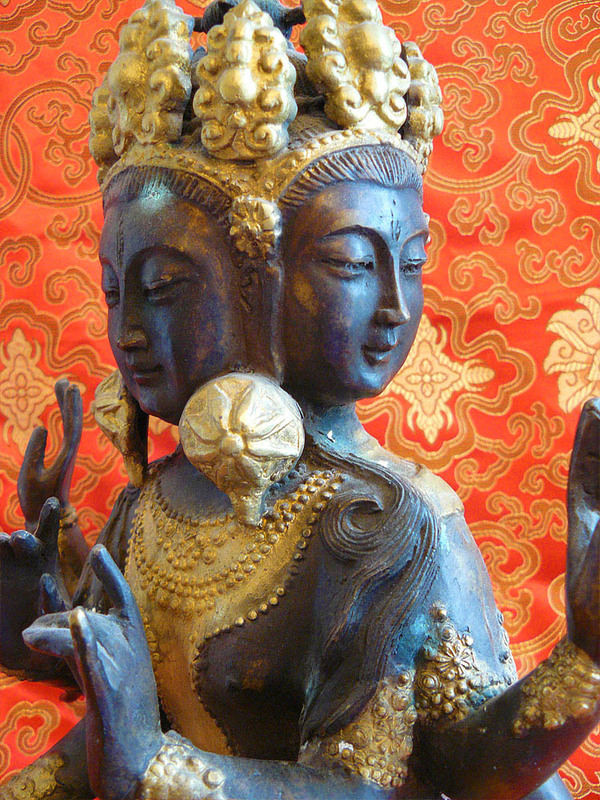 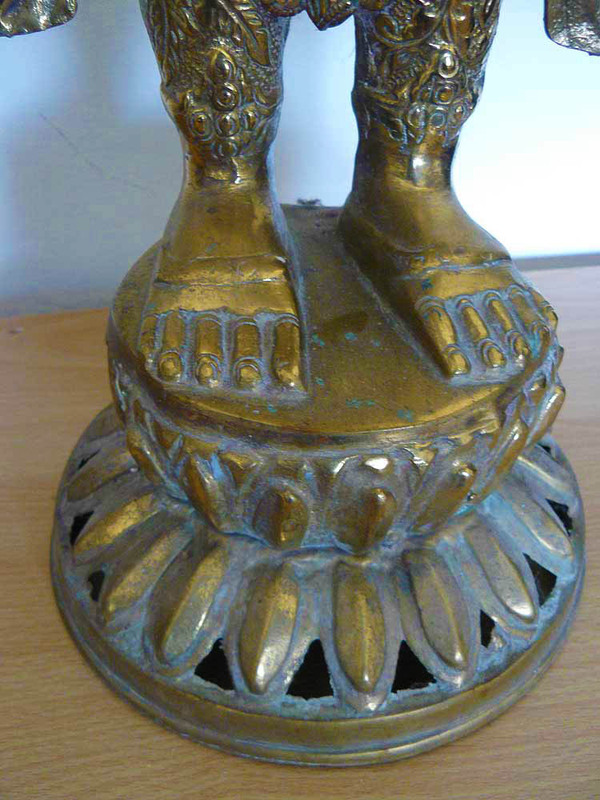 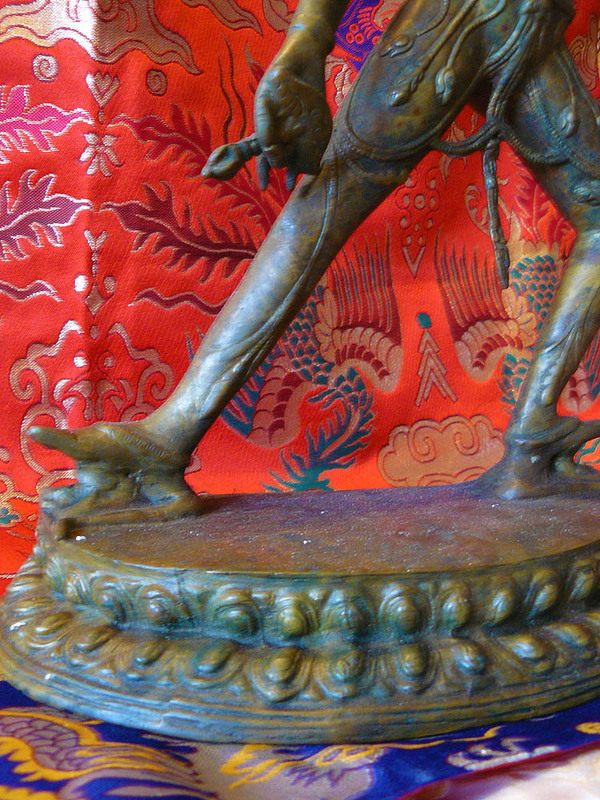 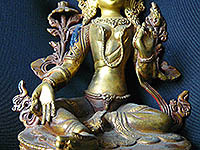 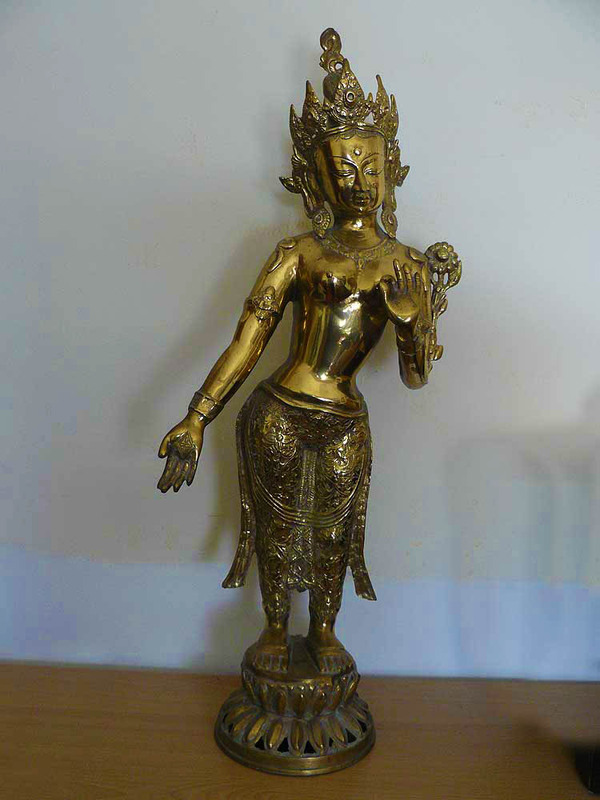 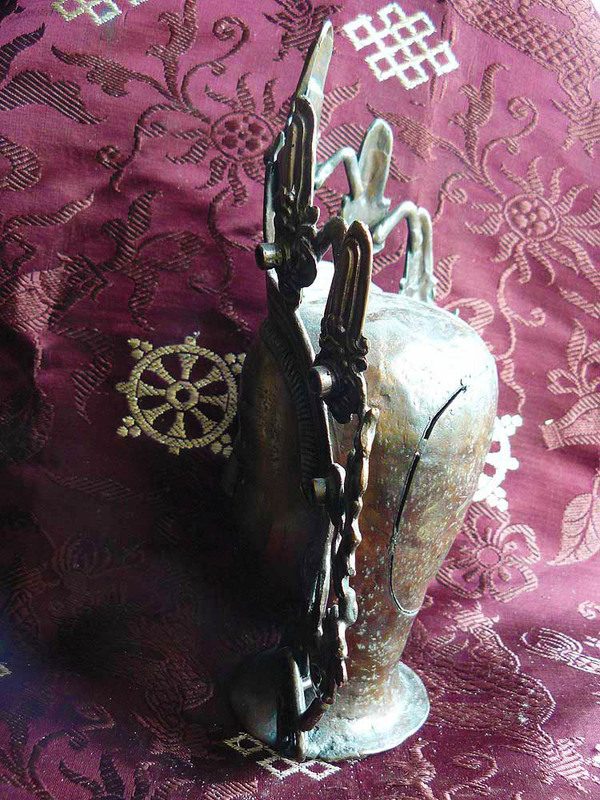 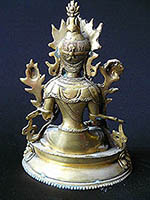 A tall, old solid bronze statue of a dakini - the enlighted aspect of the feminine - probably VajraYogini. 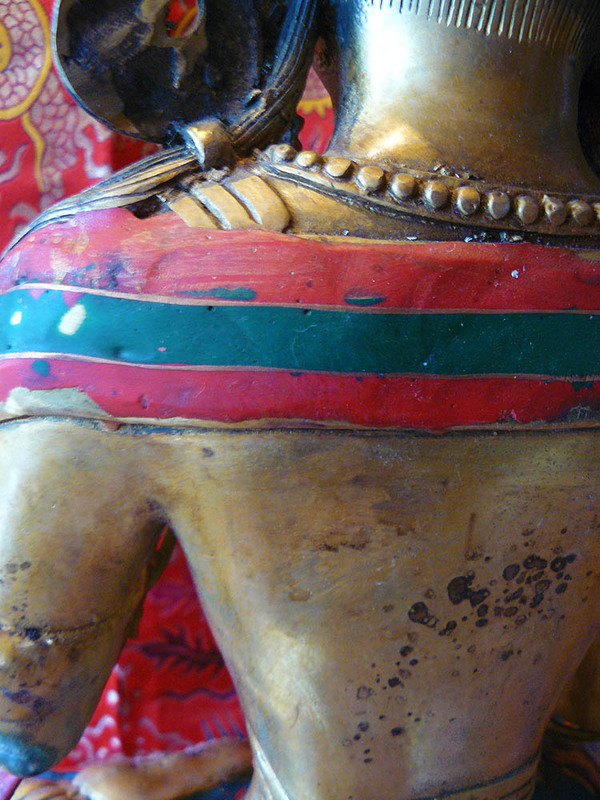 This statue - the size and weight of a small child - is an oustanding powerful example and is suitable for a large shrine room or a domestic house as a ritual object or a wonderful piece of artShe is naked except for human-bone dancers ornaments, and she holds a flaying knife and a human skull bowl and there is a ring in the crook of her arm which looks like it originally held a tantric khatvanga staff, now missing (making me think she is Vajradakini) There has never been a flame nimbus around her. 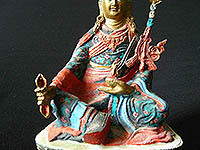 The statue is in good condition and is a splendid large example of her. 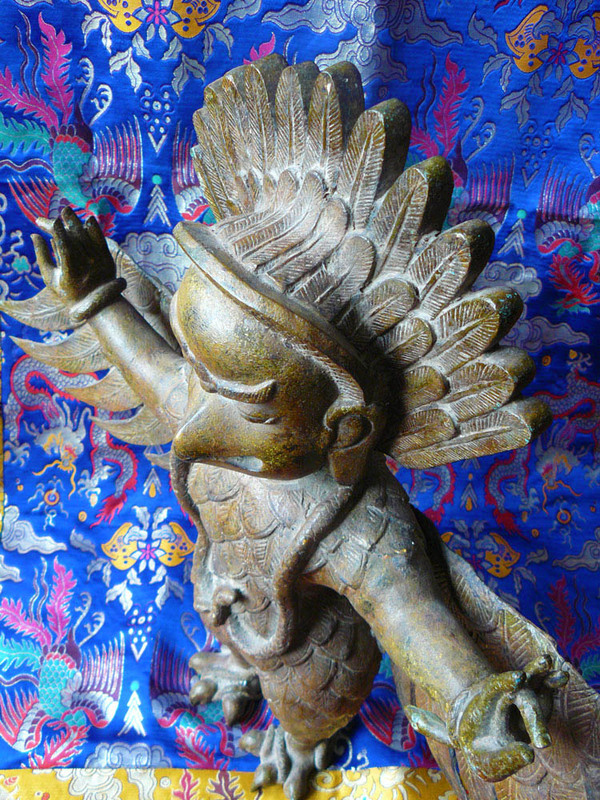 An impressive, old, very large and very heavy, solid bronze statue of a garuda. 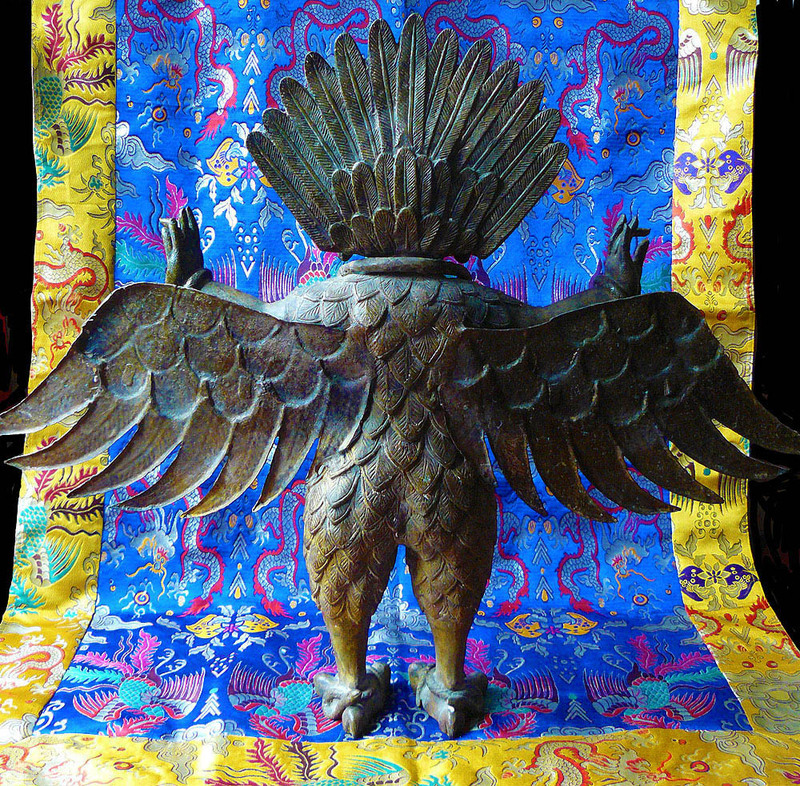 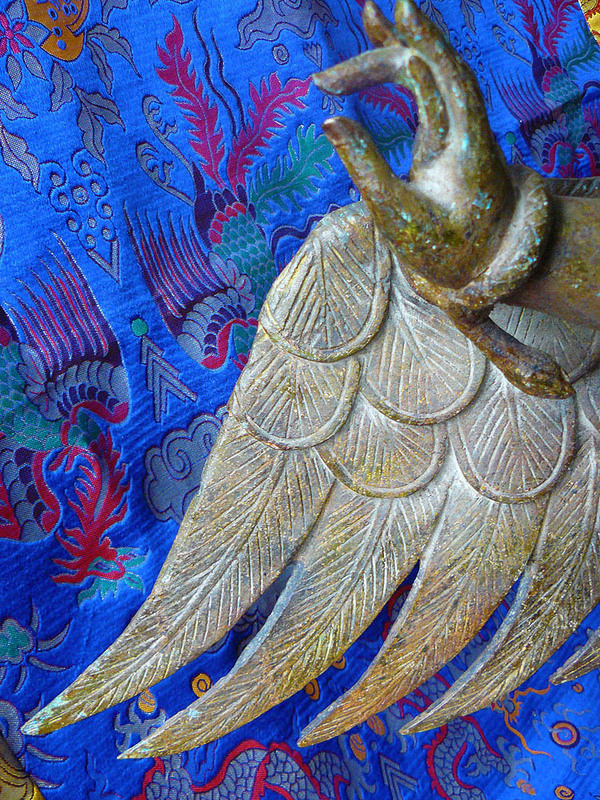 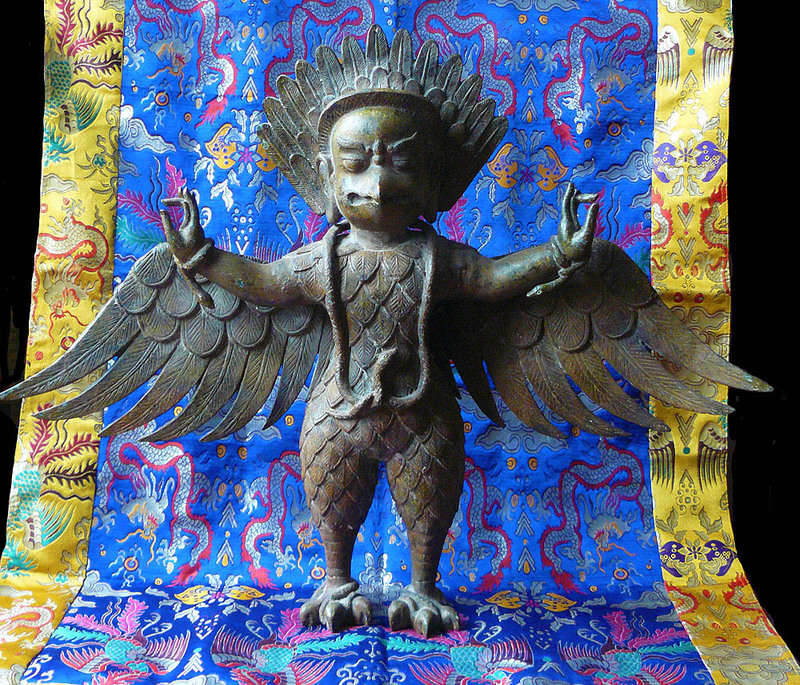 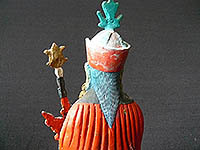 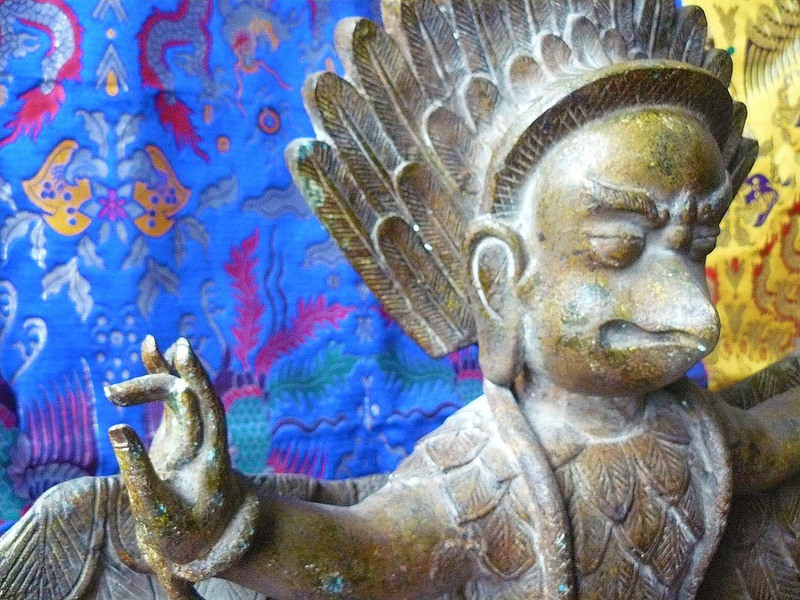 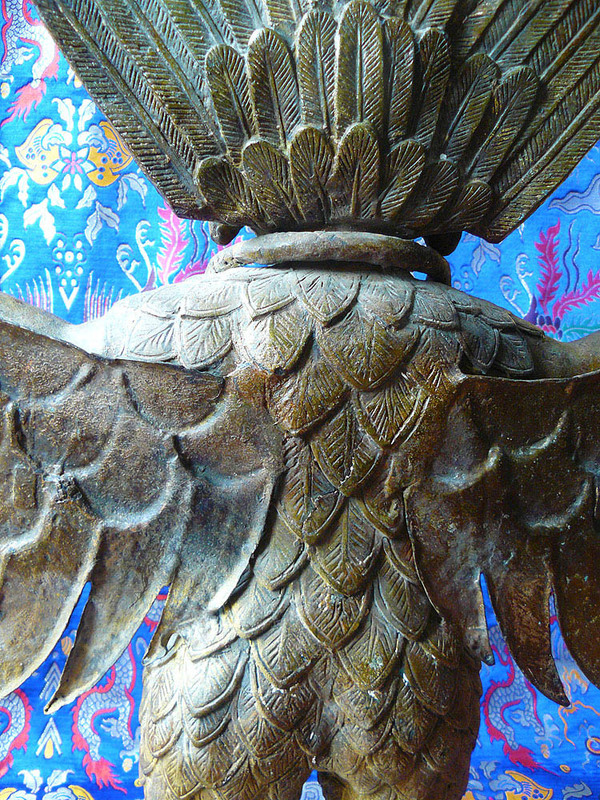 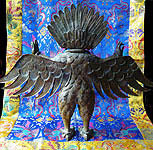 Garudas are an important aspect of Asian cosmology, right from the south of South East Asia and up into Siberia, where some shamans work with garuda birds spirits which are very much like Native American Thunderbirds. 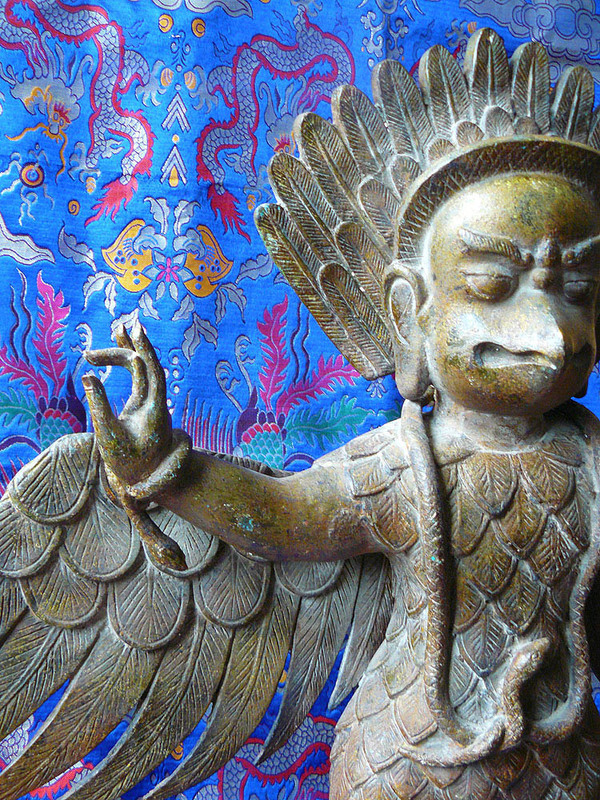 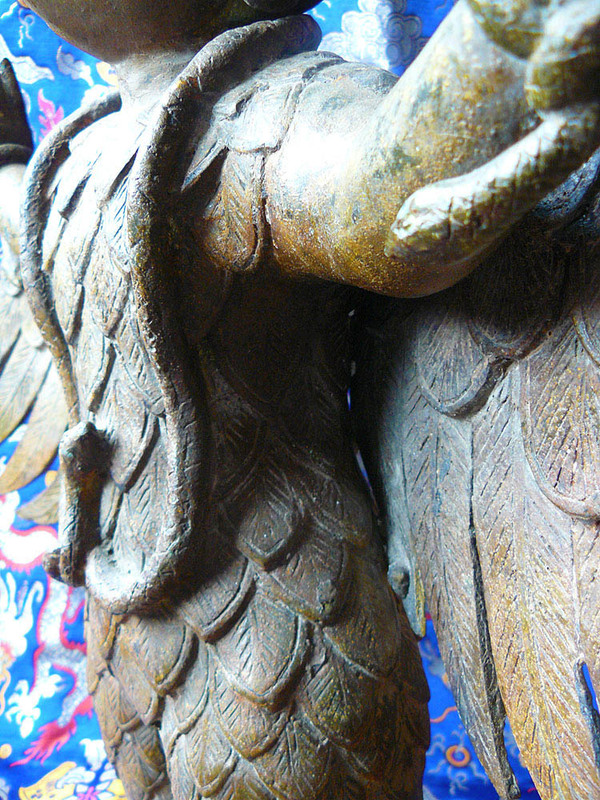 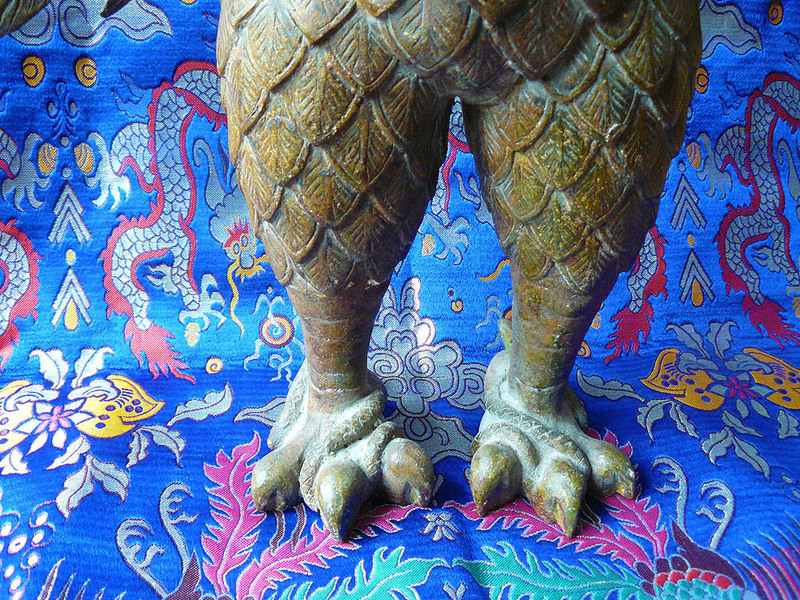 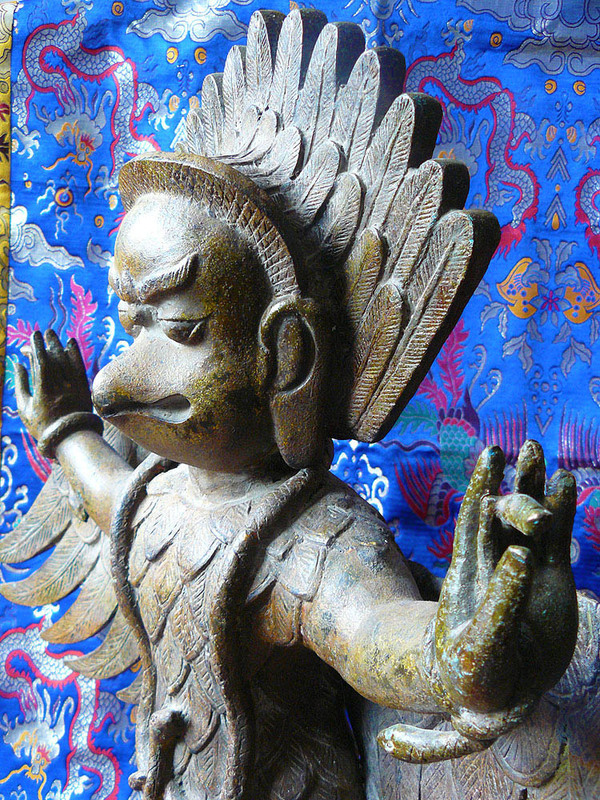 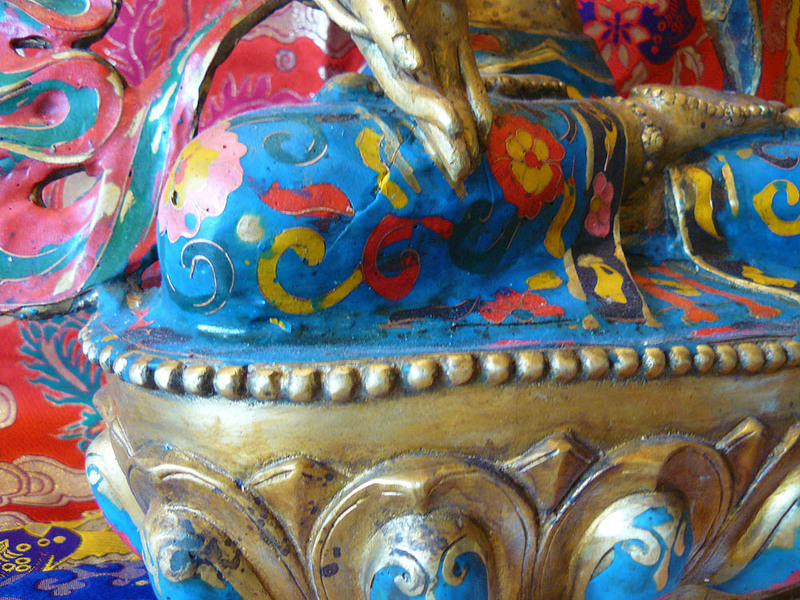 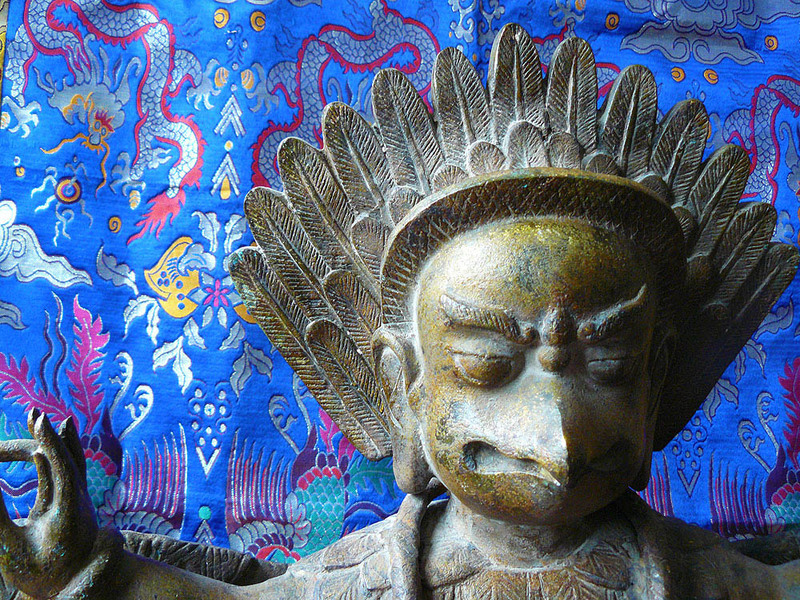 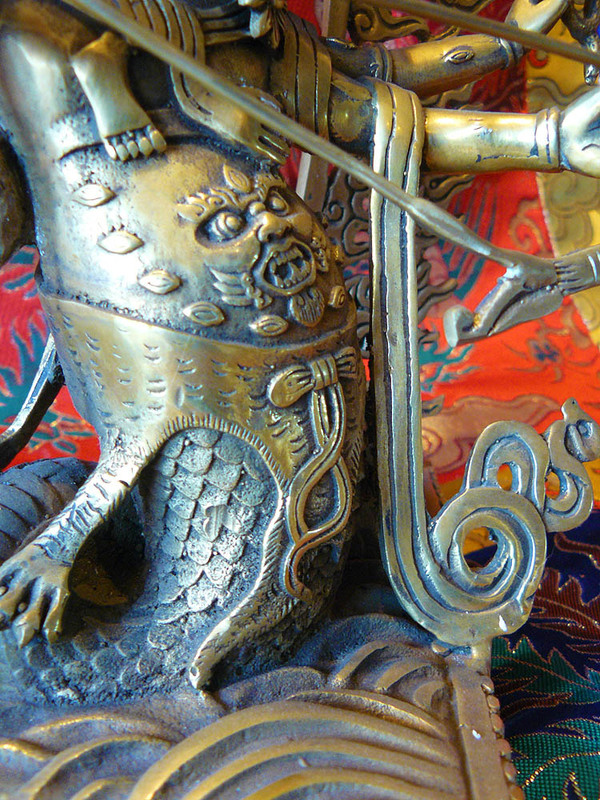 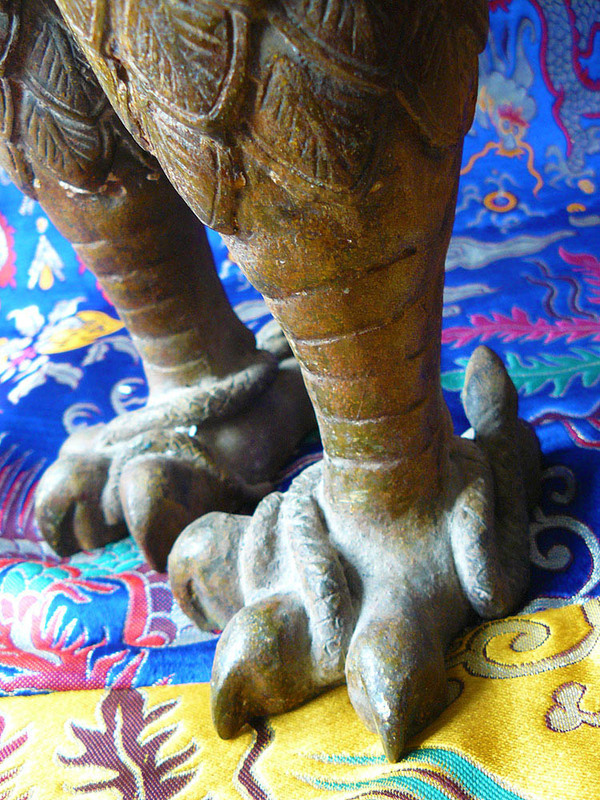 Garuda represent the air element in Tibetan Buddhism and are said to be have a wingspan of several miles. 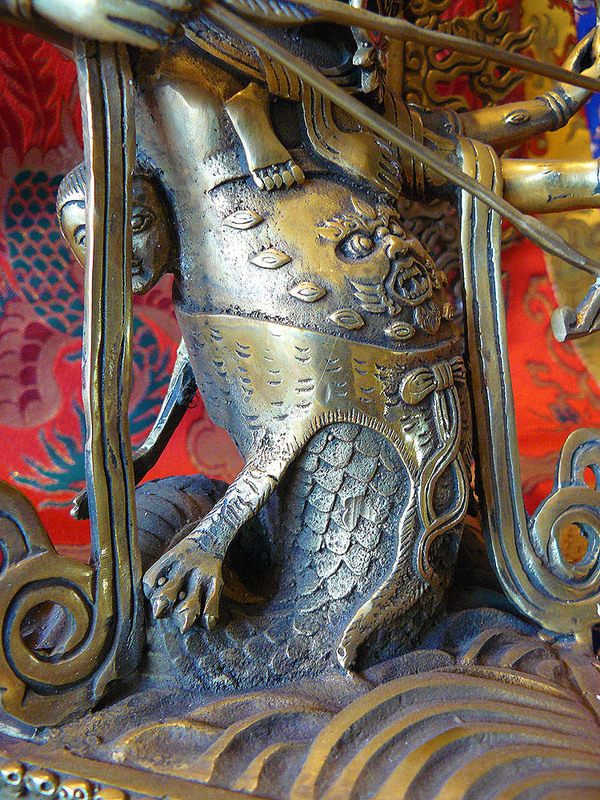 They never land and are powerful protector beings especially being the enermy of Nagas - the water spirits snakes of Asian cosmology. 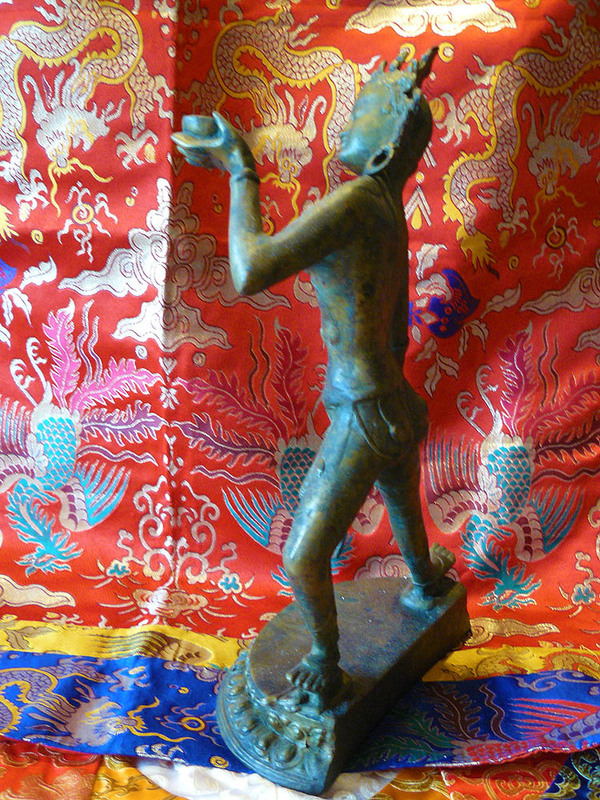 This heavy bronze statue - the size of a small child - is an oustanding powerful example and is suitable for a large shrine room or a domestic house as a ritual object or a wonderful piece of art. 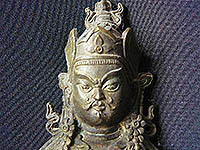 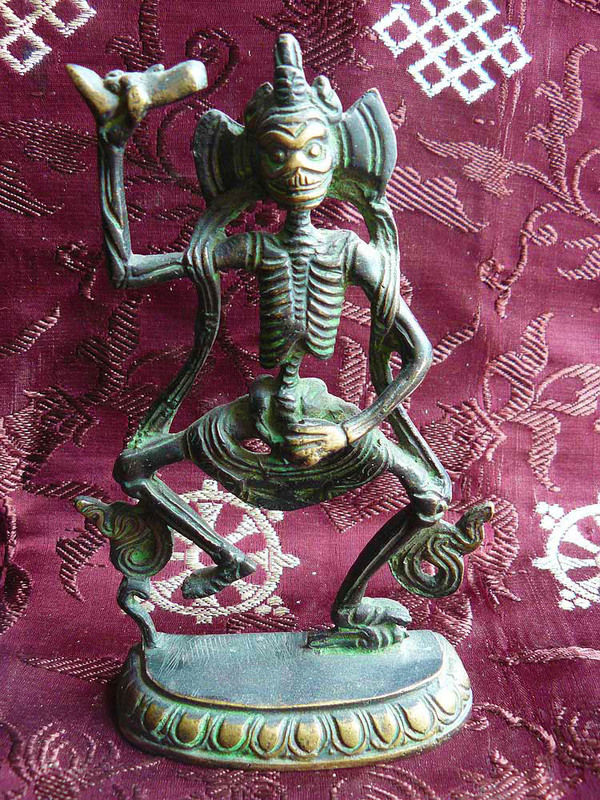 A bronze statue of the lord of the graveyard Chitipati. 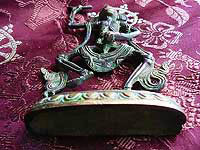 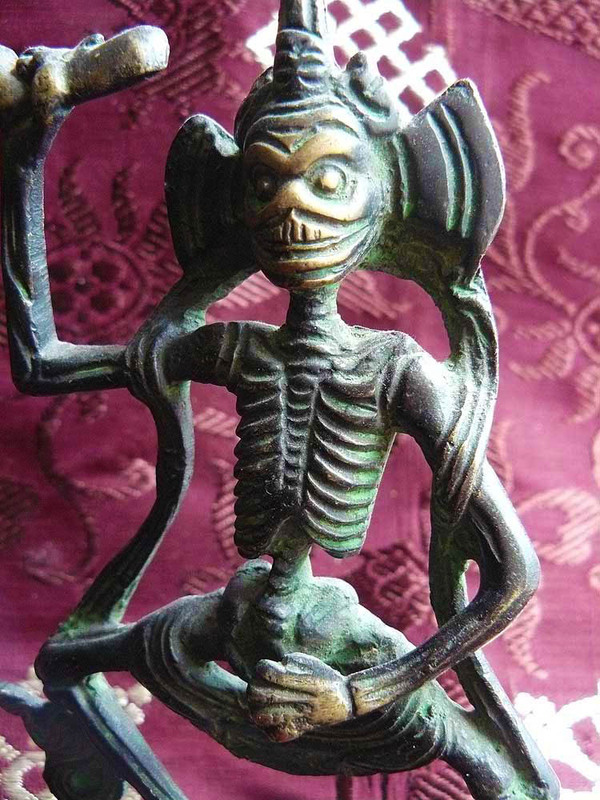 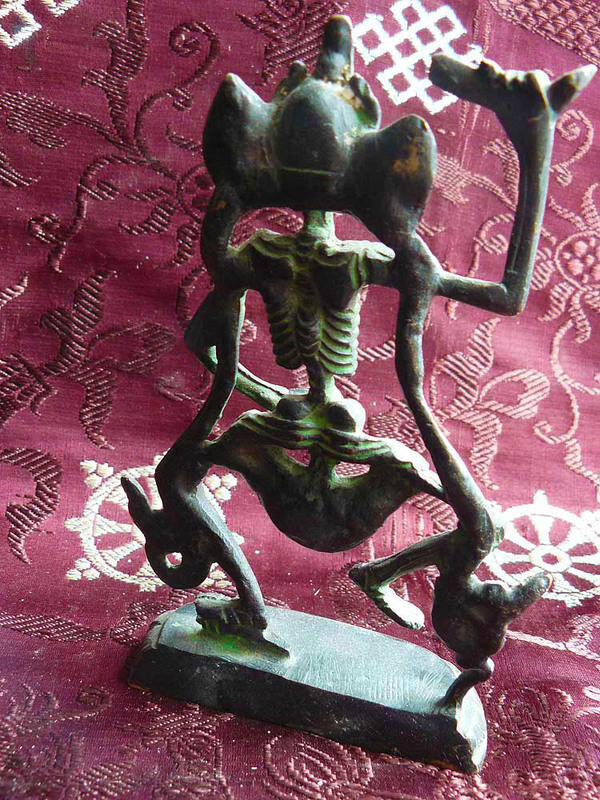 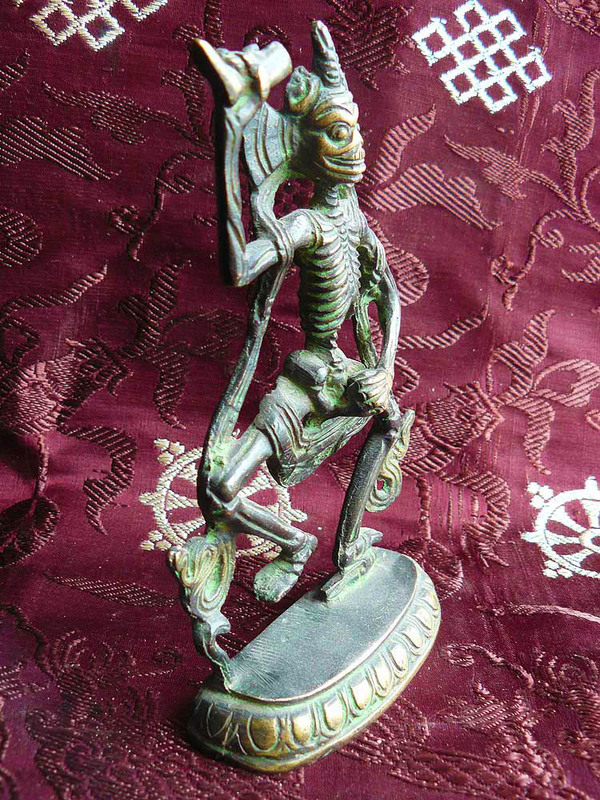 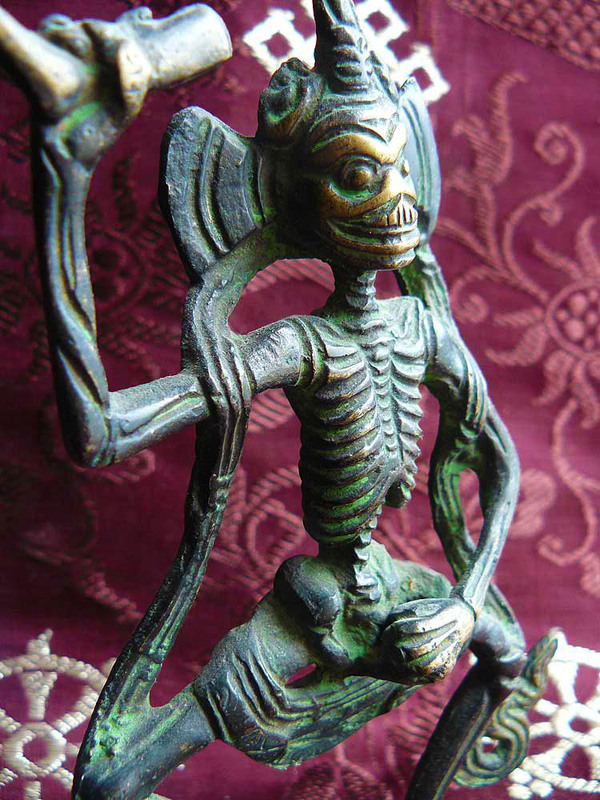 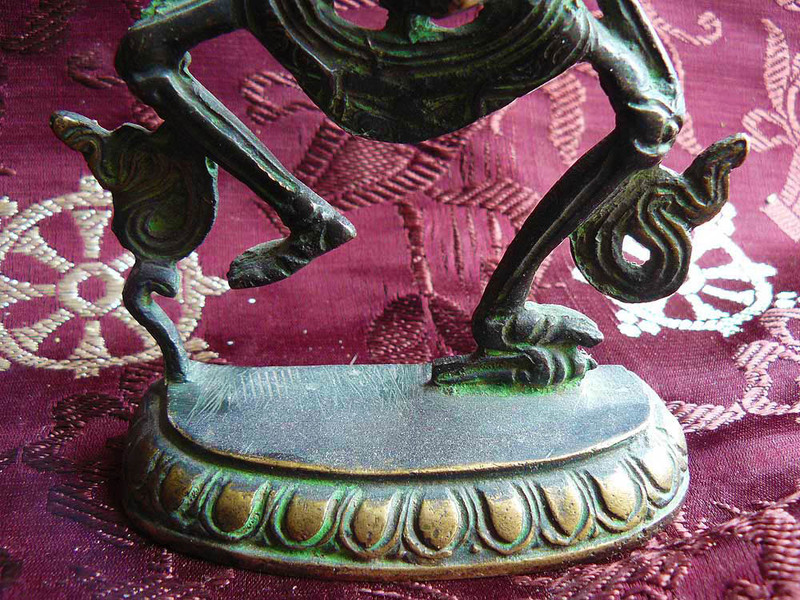 In the form of a skeleton, and often shown as a pair of male and female skeltons in sexual union, Chitipati is a special guardian spirit, especially associated as a protection against theft. 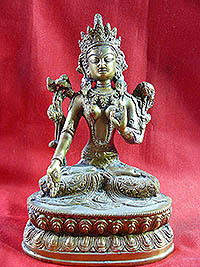 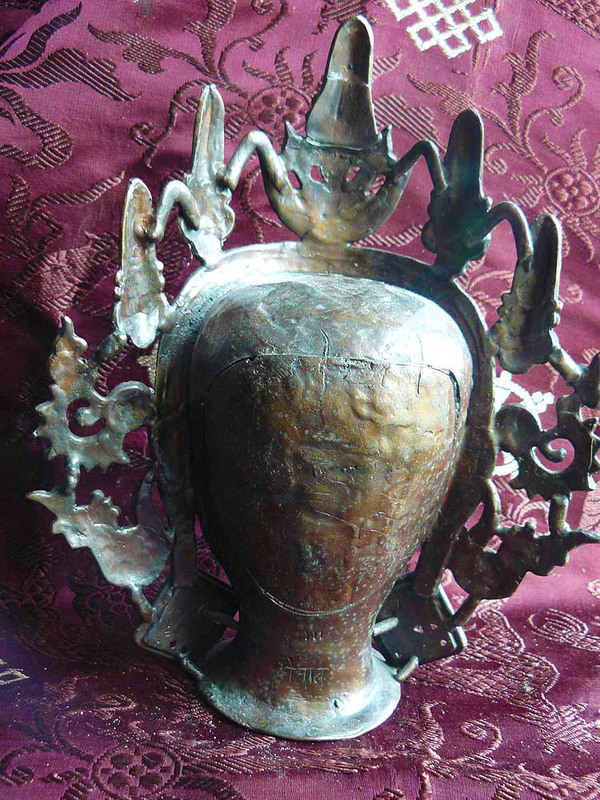 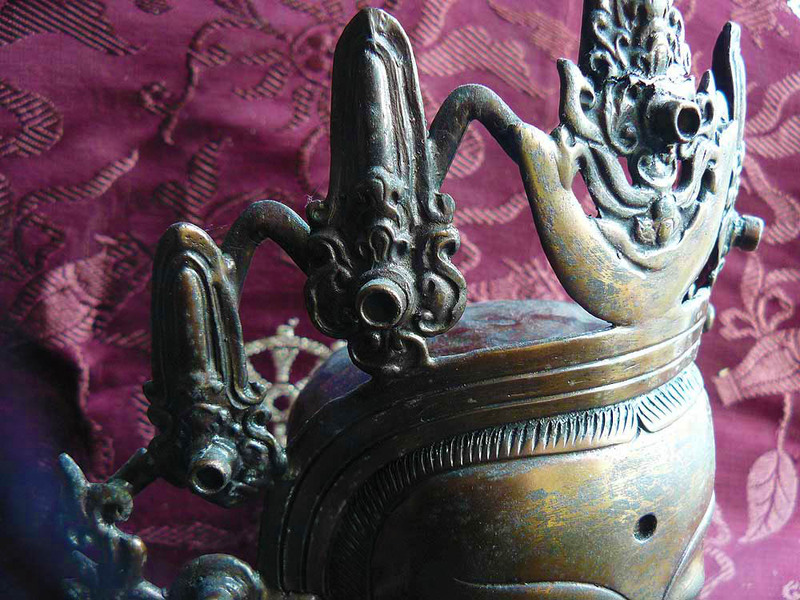 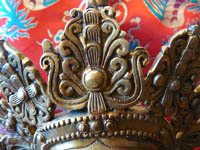 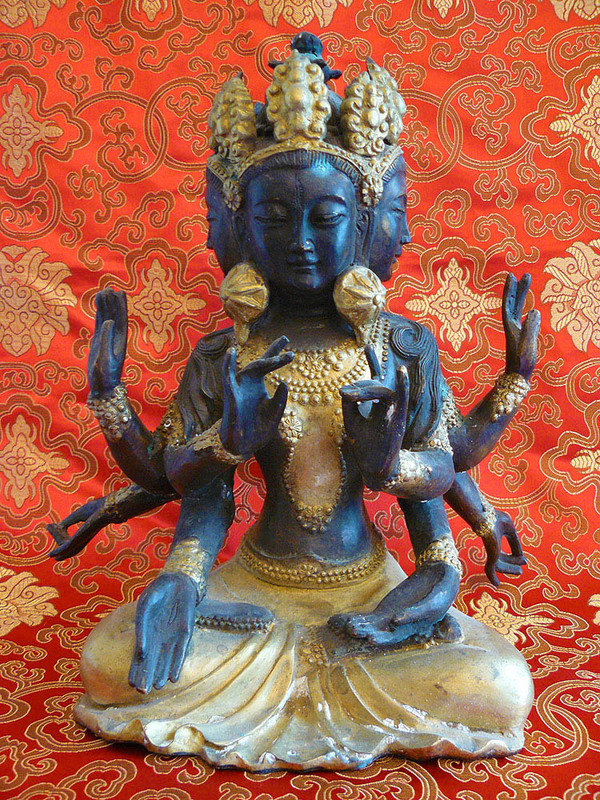 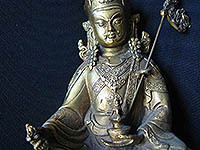 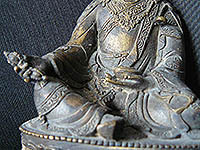 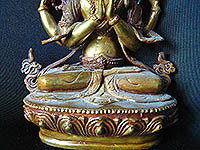 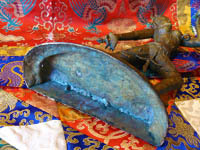 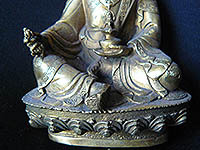 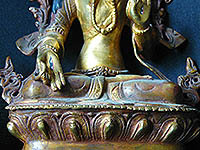 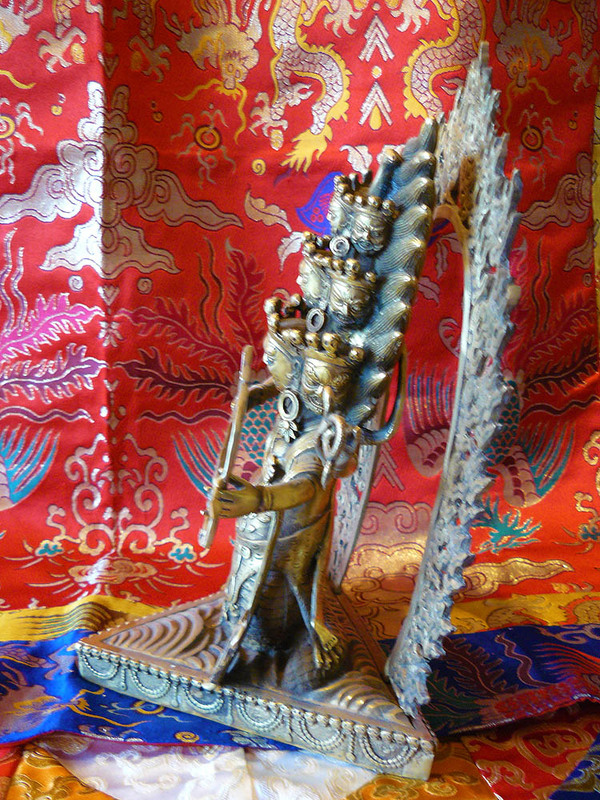 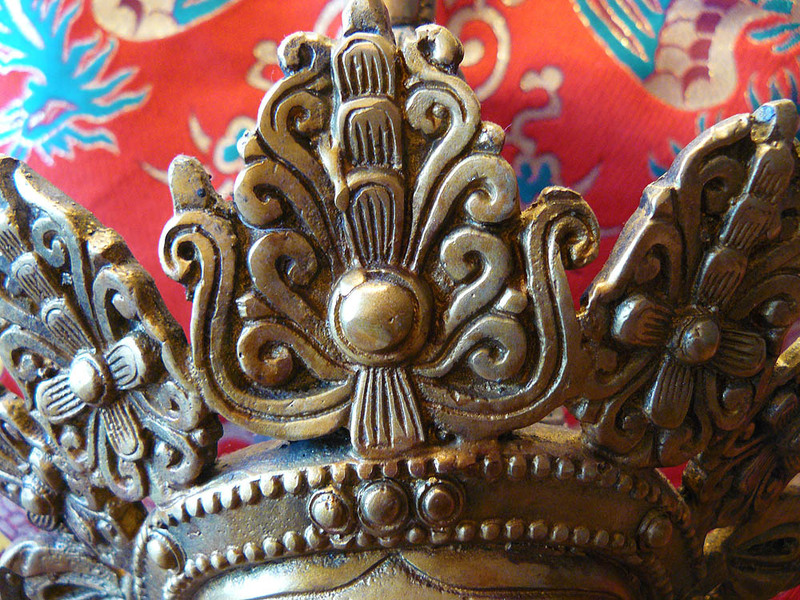 A large, heavy bronze with gold paste decoration statue of the Tibetan Buddhist long-life mother goddess Usnisha-vijaya. 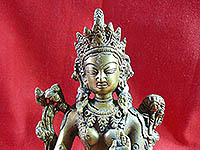 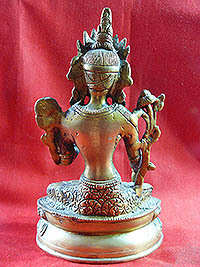 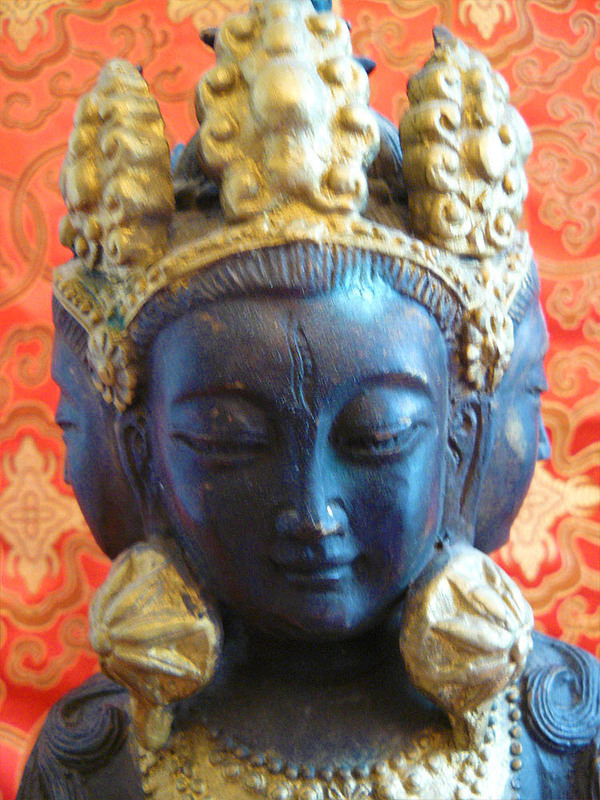 Mahapratisara has four heads and eight arms. 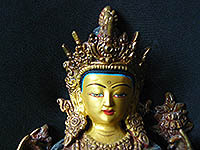 She is white in colour and often her heads are coloured yellow, white, red and green. 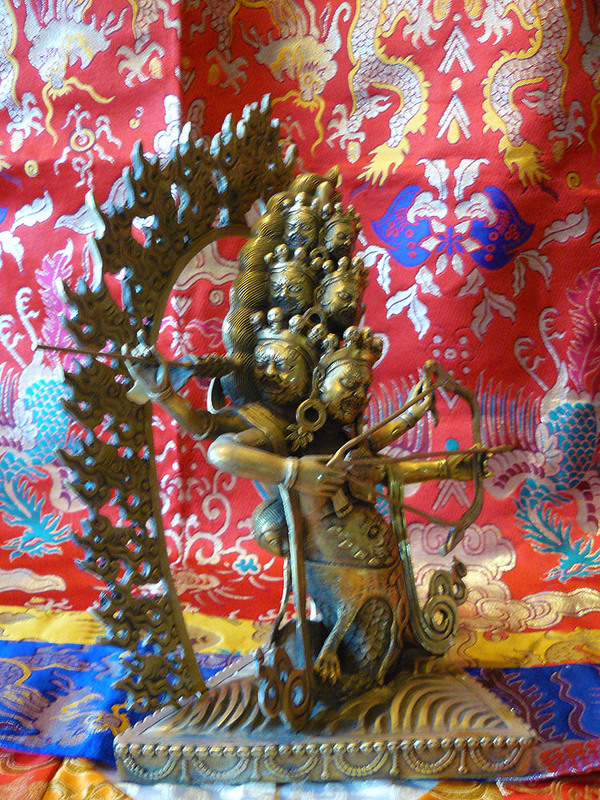 Traditionally In her right hands she holds a vajra, an arrow, a sword and in her left hands holds a trident, a bow and an axe while her two principal hands hold a wheel and a garment - although now none of these items remain with the statue. 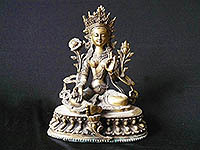 It is said that offerings and mantras made to this protectress deity gives great benefit and protection from all forms of dangers and illness, and helps to eliminate past non-virtuous karma. 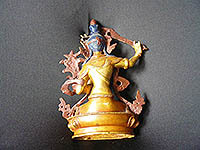 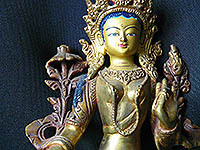 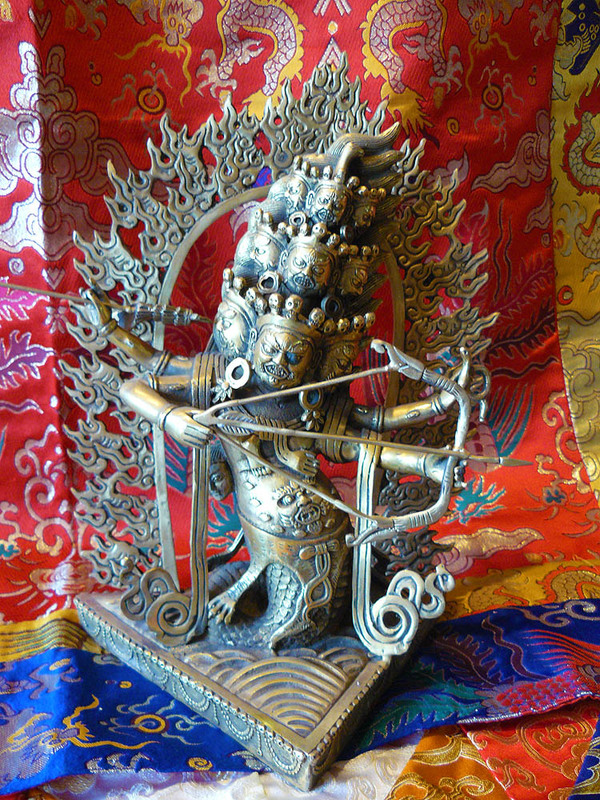 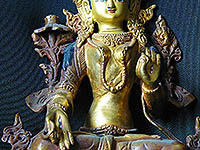 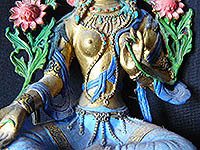 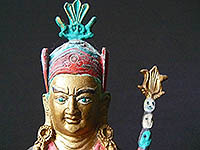 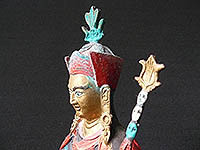 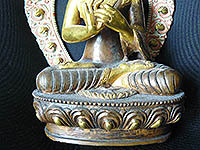 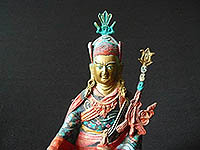 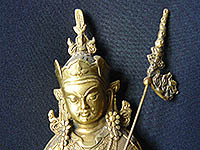 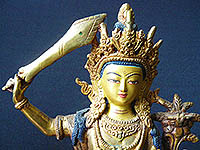 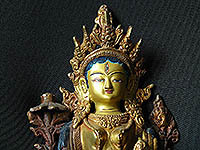 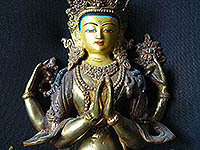 People who perform her practice are said to take rebirth in higher realms, their body becoming a vajra body which is not affected by fire, weapons and others means of harm. 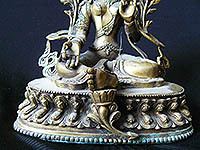 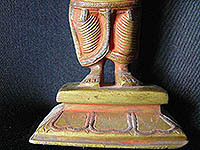 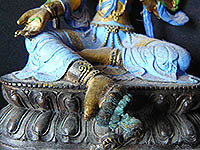 The statue is not of the highest quality, the detailing is not fine, but it is still a nicely proportioned, large rupa. 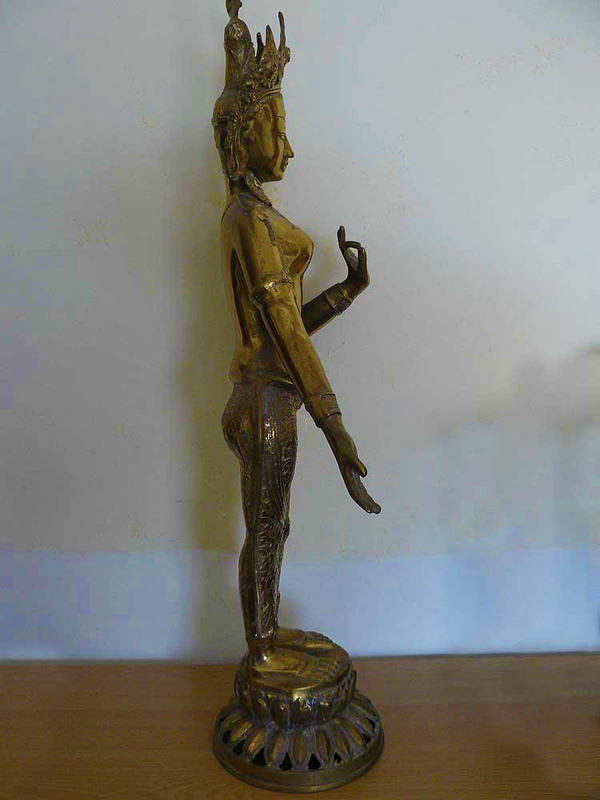 She does not hold any of the ritual objects which she normally holds, these may well have been separate to the statue and lost during it's life. 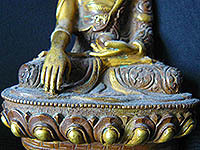 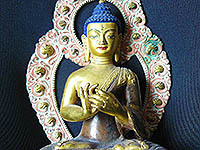 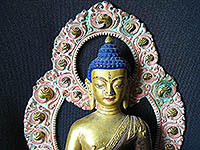 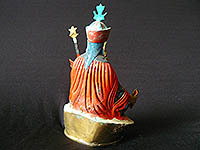 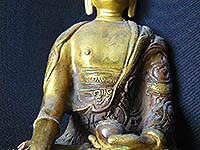 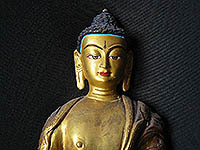 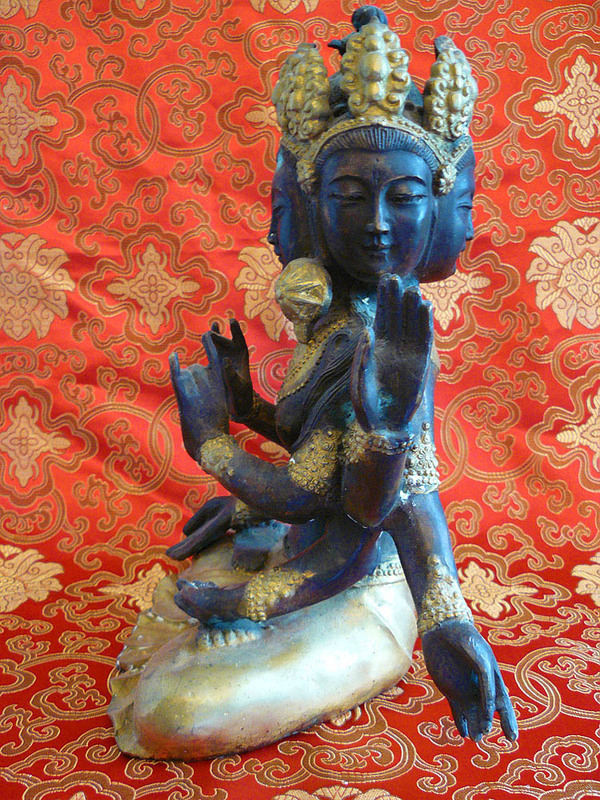 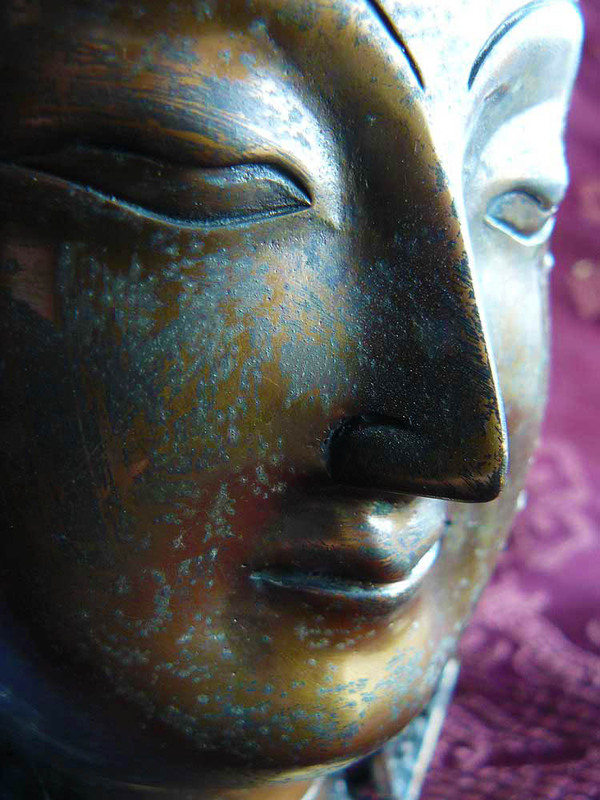 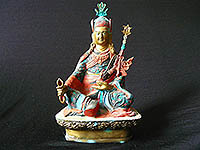 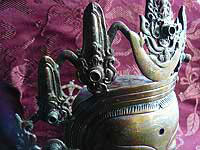 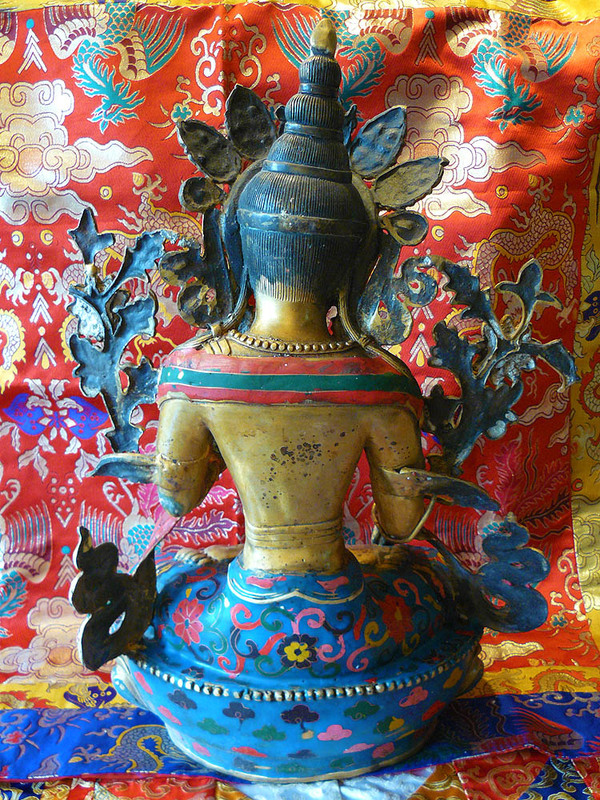 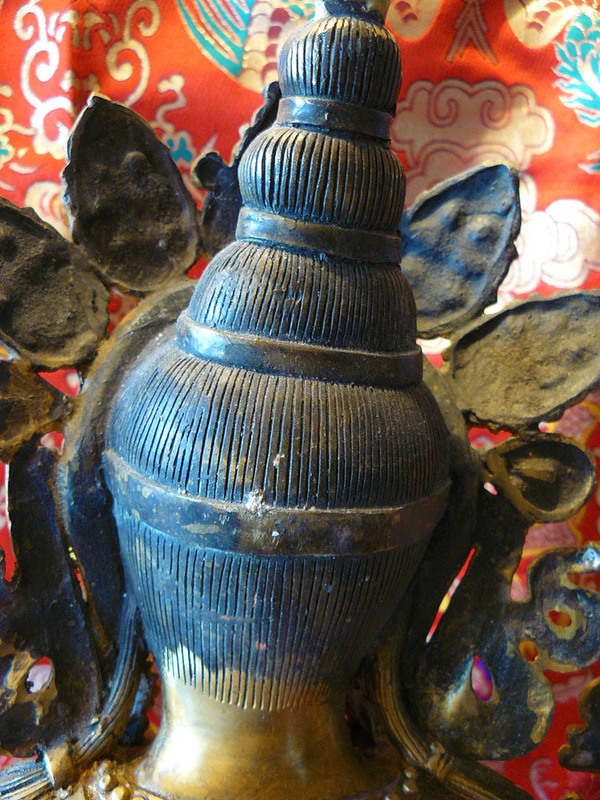 The statue is suitable for use in a shrine room, on an altar or could simply be enjoyed as a work of art.